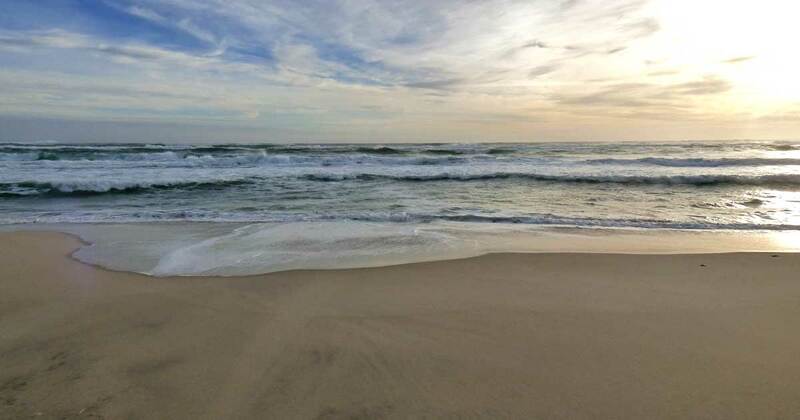 Weather summary for this date: no rain; sunshine hours 3.3; temperature maximum 19.4°C and minimum 16.3°C; with a peak wind of 31 knots southwesterly (WSW 240°). 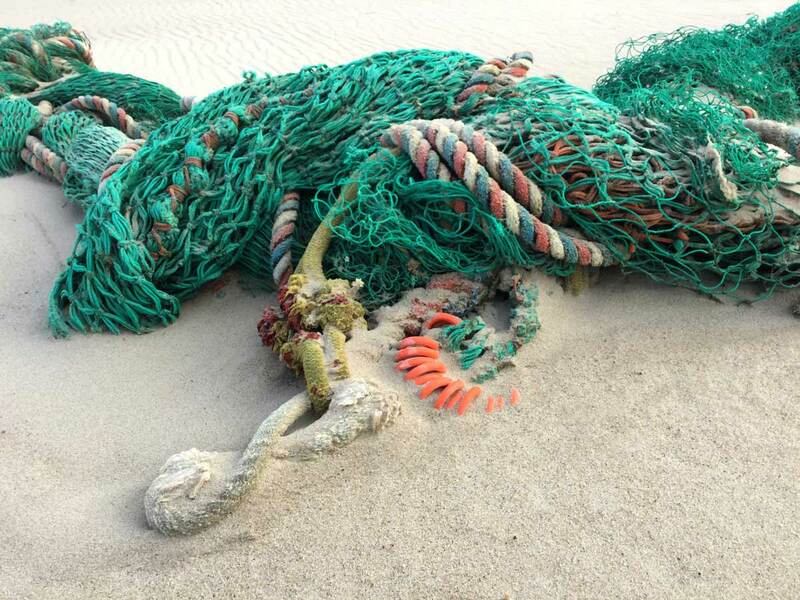 I returned to Sable Island on October 4th, and the next day encountered a heavy, rolled tangle of trawl net and rope washed ashore on the north beach. 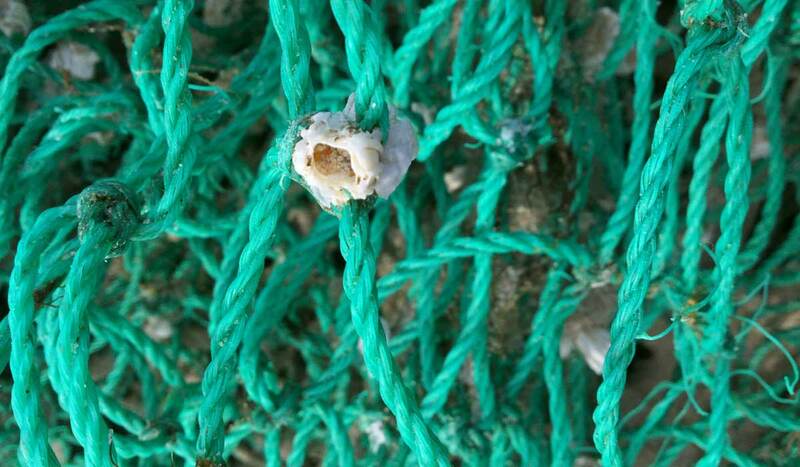 One of the many barnacles attached to strands of the trawl net’s mesh. Weather summary for this date: no rain; sunshine hours 2.2; temperature maximum 18.7°C and minimum 15.5°C; wind light. 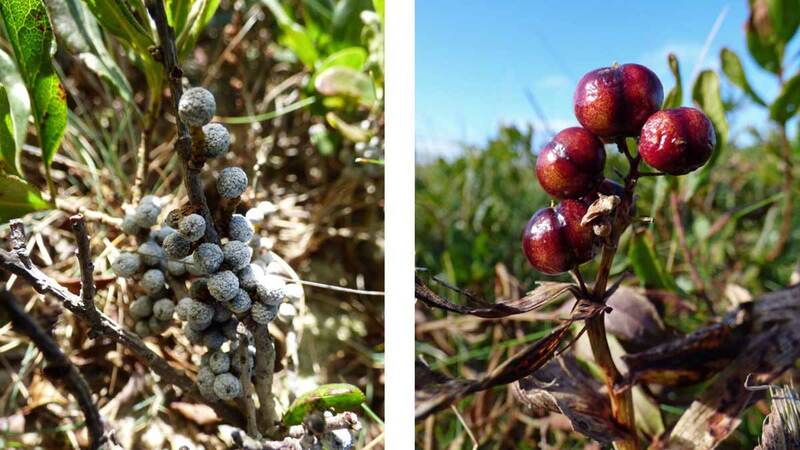 Starry False Solomon’s-seal berries, and two caterpillars, common on the island. 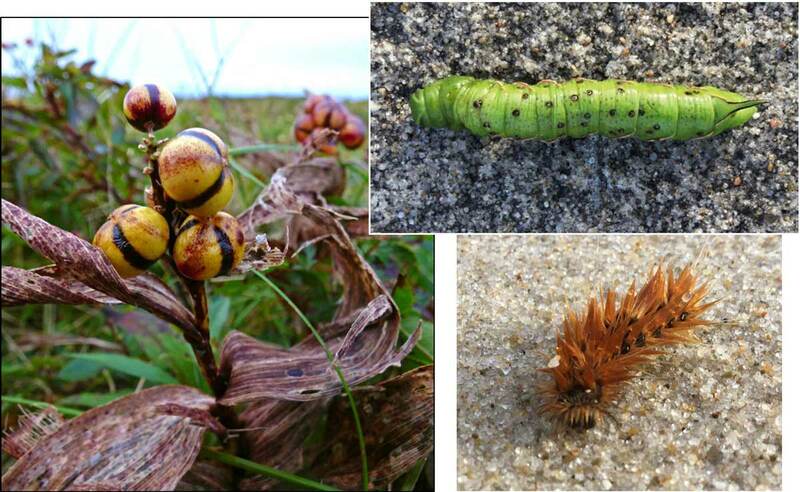 The woolly, rust-coloured caterpillar is soggy—it had a close encounter on the beach, at the edge of a wave. 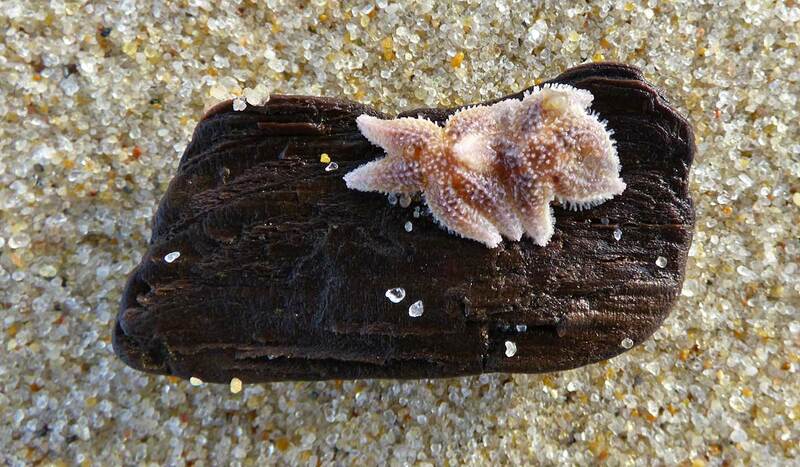 Two small starfish on a fragment of waterlogged wood washed up on the beach. Weather summary for this date: no rain; sunshine hours 10.1; temperature maximum 19.6°C and minimum 14.6°C; wind light. 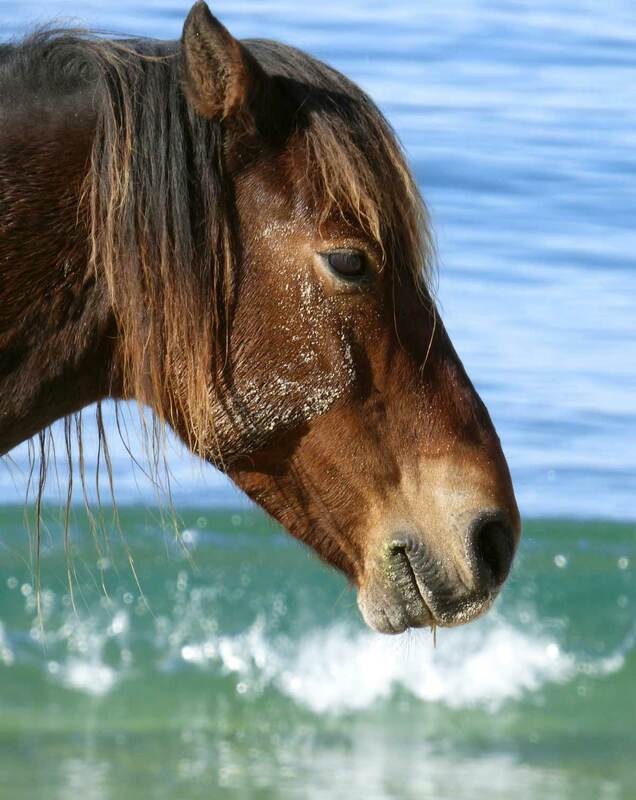 A Sable Island horse stands resting on the beach near the edge of the water. Weather summary for this date: rain 0.2 mm; fog; sunshine hours 0.0; temperature maximum 19.3°C and minimum 17.5°C; with a peak wind of 22 knots southwesterly (SW 230°). 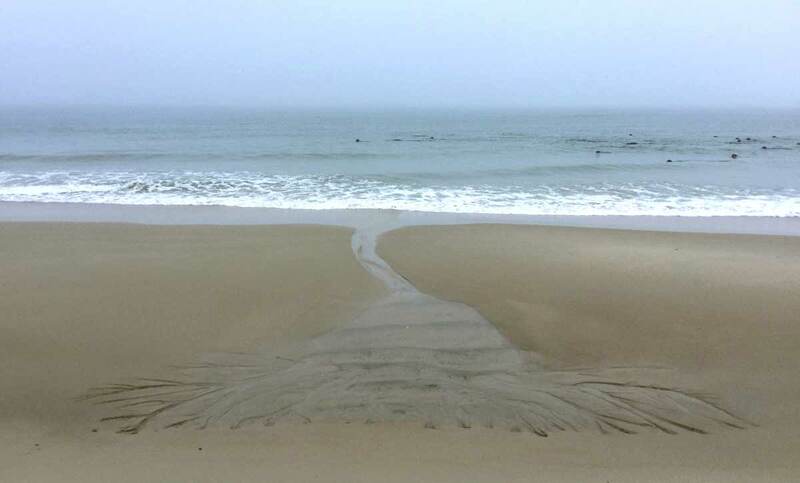 A drainage pattern on north beach, looking like the imprint of a huge sea fan. Weather summary for this date: no rain; sunshine hours 7.9; temperature maximum 18.4°C and minimum 11.4°C; with a peak wind of 26 knots southwesterly (SW 230°). 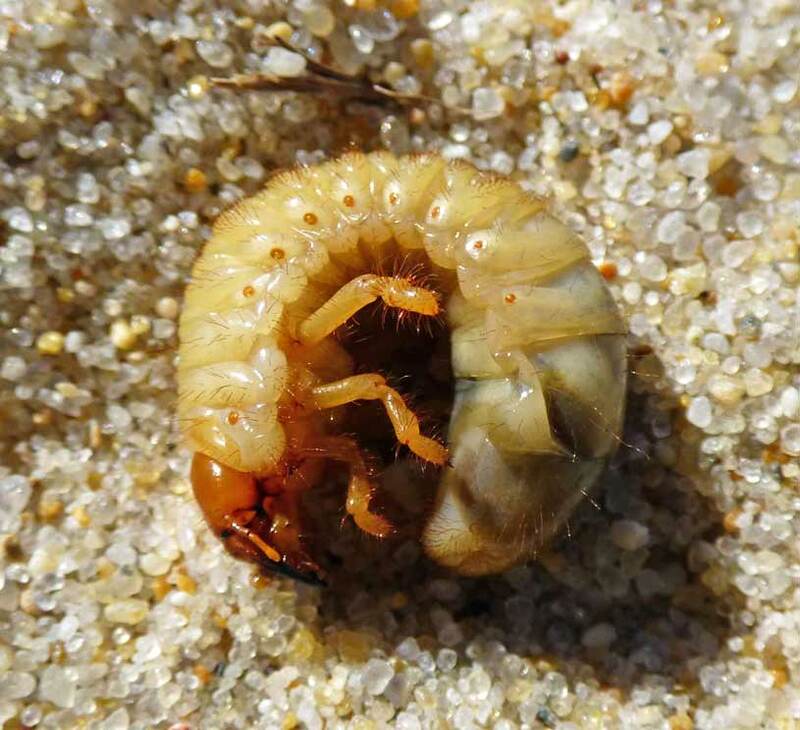 The larva of a June Beetle squirming on the sand, perhaps exposed when a horse galloped through the area, kicking up loose sand. 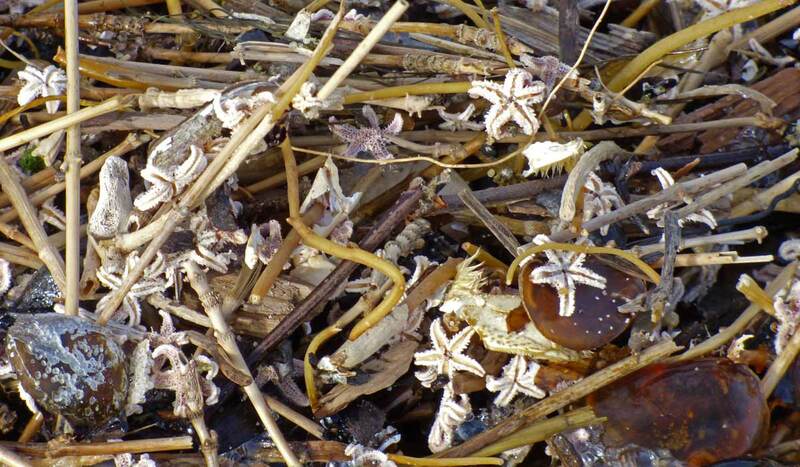 There were thousands of small starfish ‘skeletons’ mixed in with other natural debris in the driftline on the north beach—fragments of beach plants, seaweed, pieces of crab shells, and moon snail operculums. Weather summary for this date: no rain; sunshine hours 9.7; temperature maximum 17.5°C and minimum 11.8°C; with a peak wind of 20 knots southwesterly (SSW 200°). Sunset (6:20 pm local time, 21:20 GMT), heavy with altocumulus clouds. The dark patch is a cloud projection casting a shadow as the sun sets. 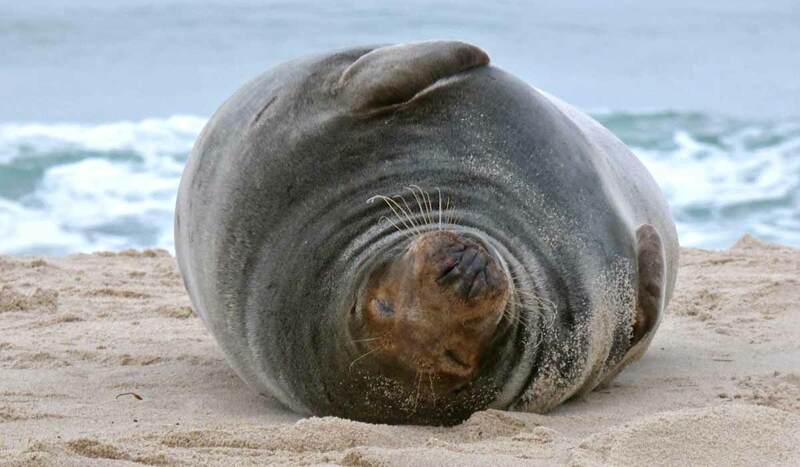 Two Grey Seals and a band of horses on the north beach. 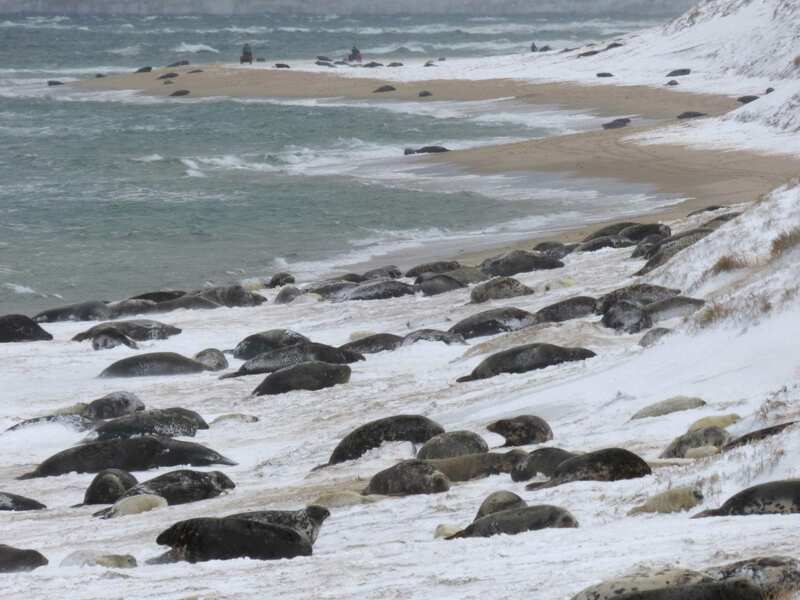 There had been a large herd of seals hauled out just above the high tide line. 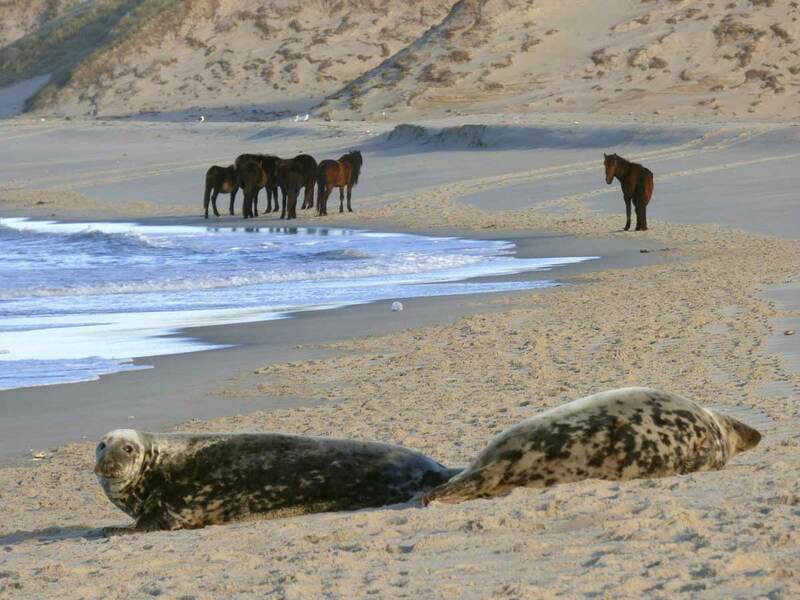 The horses were wandering along the shore, and, as they passed, most of the seals went into the water. Weather summary for this date: no rain; sunshine hours 7.7; temperature maximum 19.3°C and minimum 13.9°C; with a peak wind of 29 knots northwesterly (NW 310°). 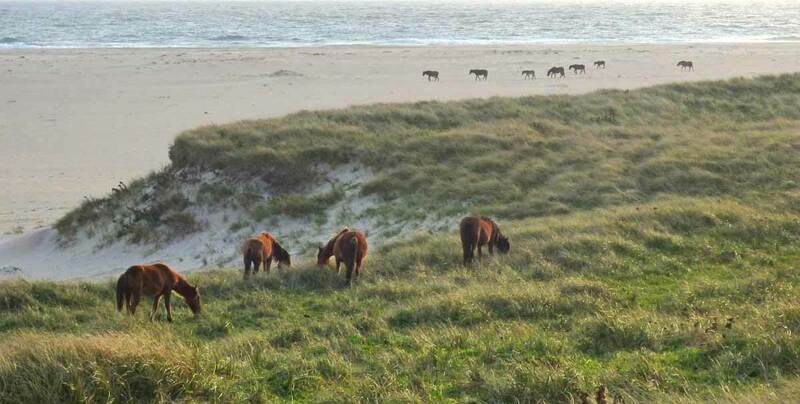 A family band of Sable Island horses grazes in an area of grasses and Beach Pea, while another band ambles eastward on the south beach, heading for the watering area near West Light. Weather summary for this date: no rain; sunshine hours 7.6; temperature maximum 12.1°C and minimum 7.2°C; with a peak wind of 27 knots northwesterly (NW 320°). Bayberries (pale blue-grey coating), and the ripe, wine-red berries of Starry False Solomon’s-seal. 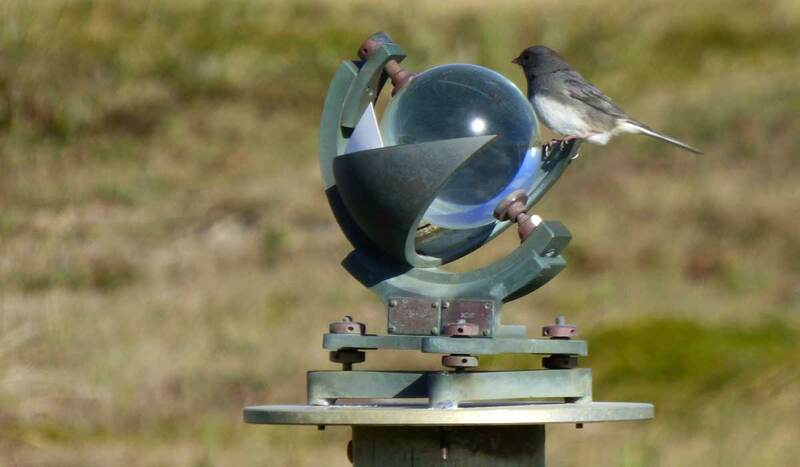 A Junco perched on the Campbell-Stokes Sunshine Recorder near the Meteorological Service of Canada’s office on Sable Island. 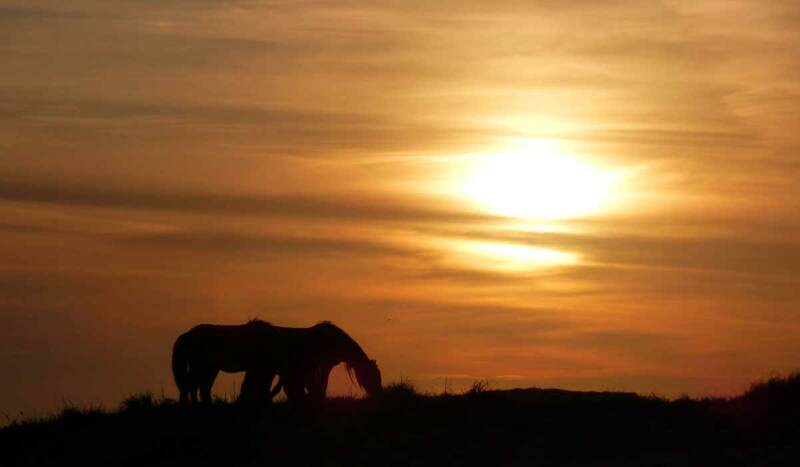 The bright sunshine program is now maintained by the Sable Island Institute. Weather summary for this date: no rain; sunshine hours 7.7; temperature maximum 15.0°C and minimum 6.8°C; with a peak wind of 17 knots southwesterly (SW 230°). 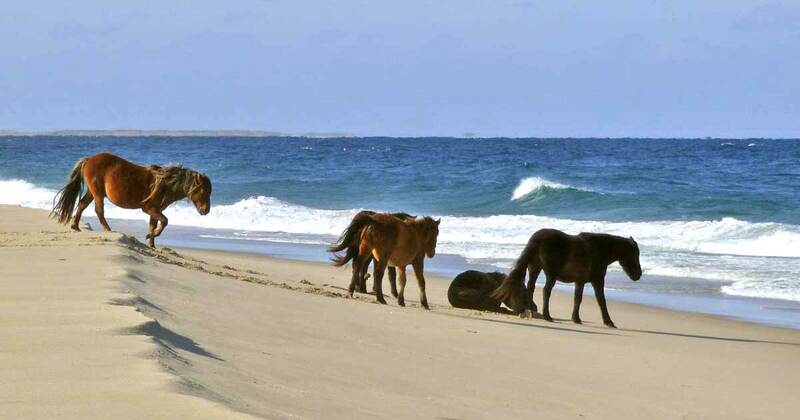 Three Sable Island horses—a group of males—walking eastward along the south beach. In the distance, looking a lot closer than it is, is the Thebaud Platform Complex (the Wellhead, Compression and Process Platforms). Weather summary for this date: no rain; sunshine hours 8.1; temperature maximum 17.2°C and minimum 13.3°C; with a peak wind of 19 knots southwesterly (WSW 240°). Sanderlings standing on the north beach, near the edge of the water. 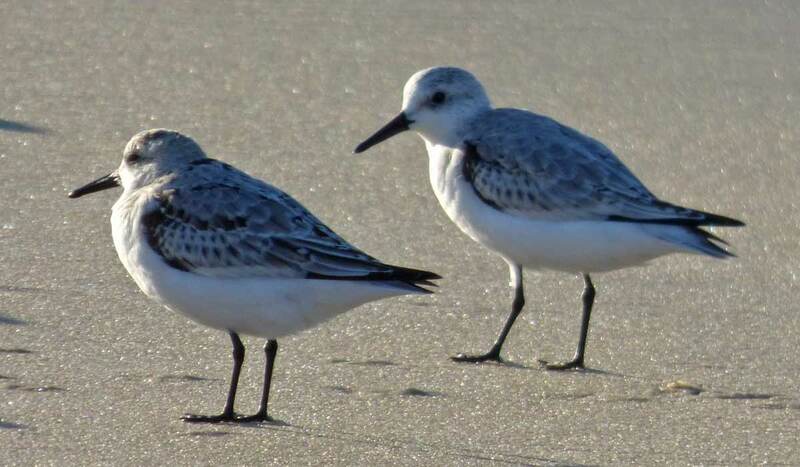 These shorebirds are commonly seen on Sable Island, sometimes in small groups, and occasionally in flocks of about 500 individuals. Weather summary for this date: no rain; sunshine hours 9.6; temperature maximum 17.7°C and minimum 13.3°C; with a peak wind of 17 knots southeasterly (SSE 150°). 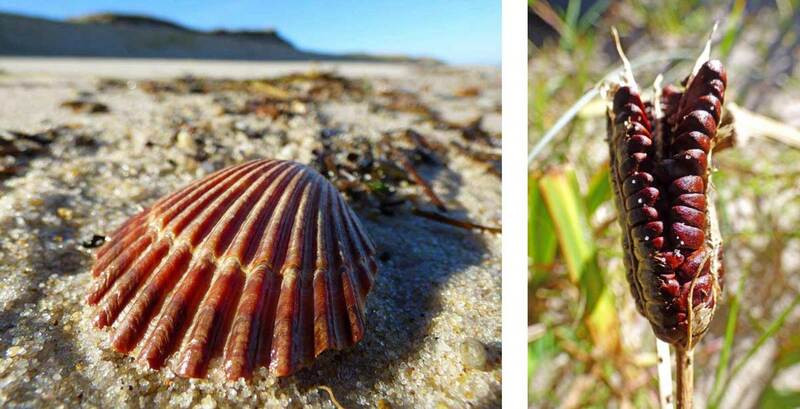 A bay scallop shell washed ashore on the north beach, and the open seed pod of a blue-flag iris growing near a freshwater pond. Weather summary for this date: rain 2.2 mm; sunshine hours 0.0; temperature maximum 16.4°C and minimum 12.1°C; with a peak wind of 25 knots southeasterly (SE 140°). 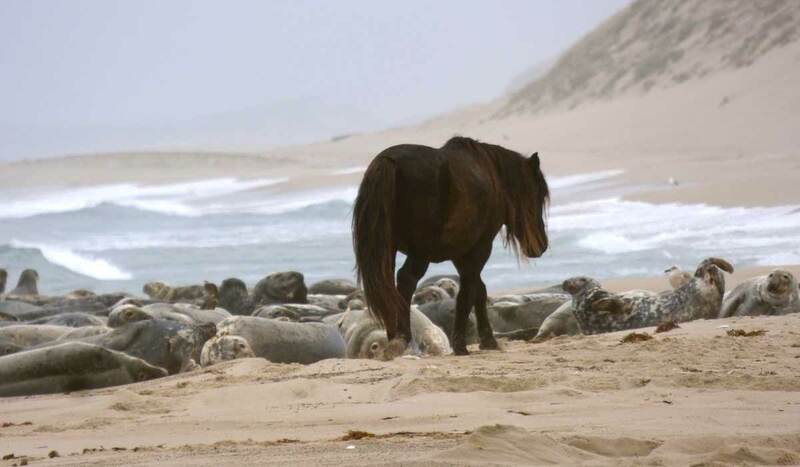 A Sable Island horse wanders along north beach past a herd of Grey Seals. 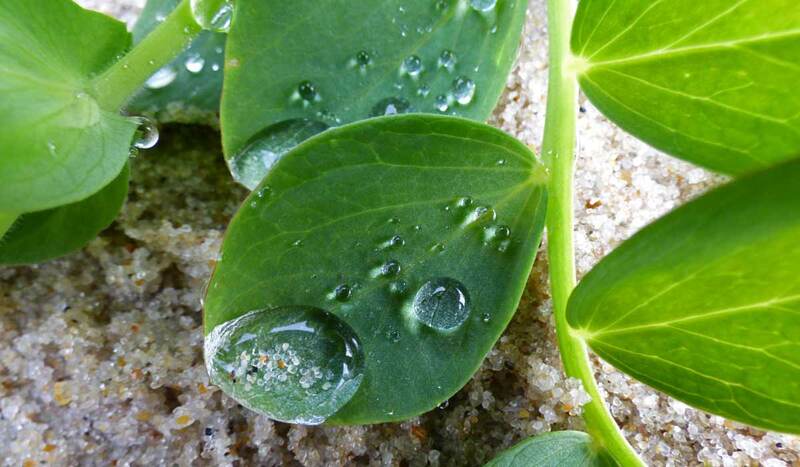 Leaves of Beach Pea, an important forage plant for the Sable Island horses. Weather summary for this date: rain 5.8 mm; sunshine hours 9.6; temperature maximum 15.8°C and minimum 12.8°C; with a peak wind of 26 knots southwesterly (WSW 240°). 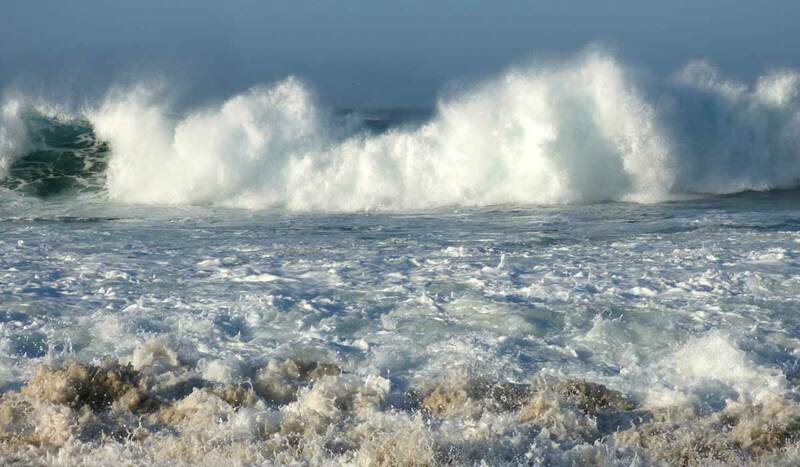 The heavy surf churns up sand as it rushes ashore. 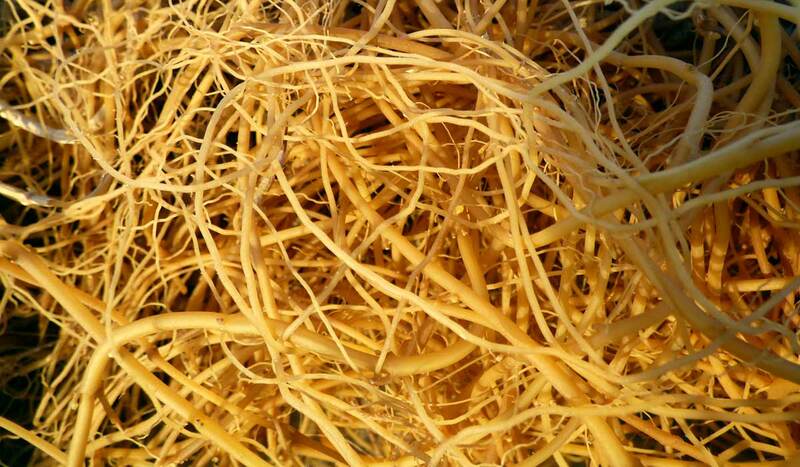 Floats from nets and ropes commonly wash up on the beach. The devilish appearance of the seal skull—having several elements of the cranium missing—seems appropriate for this date, October 31st. Weather summary for this date: no rain; sunshine hours 8.8; temperature maximum 15.2°C and minimum 4.4°C; with a peak wind of 20 knots southeasterly (SE 130°). 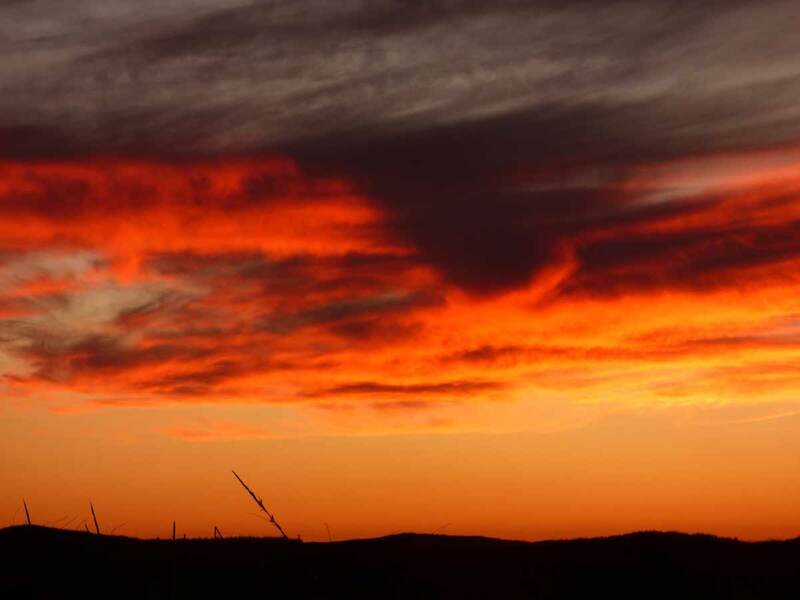 Sunset (5:25 pm local time, 20:25 GMT)—altocumulus clouds, with cirrus above. 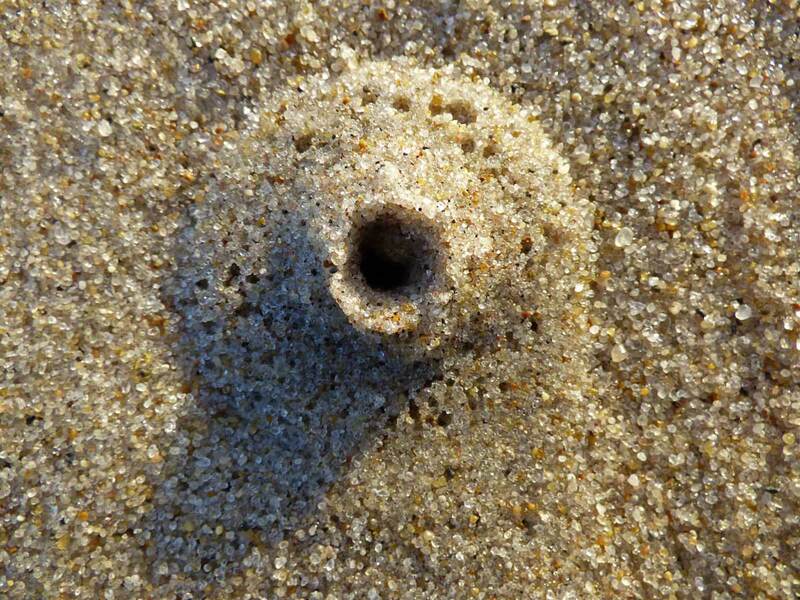 A small hole in the wet sand. Weather summary for this date: rain 5.6 mm; sunshine hours 9.1; temperature maximum 15.9°C and minimum 8.3°C; with a peak wind of 33 knots northwesterly (NW 320°). 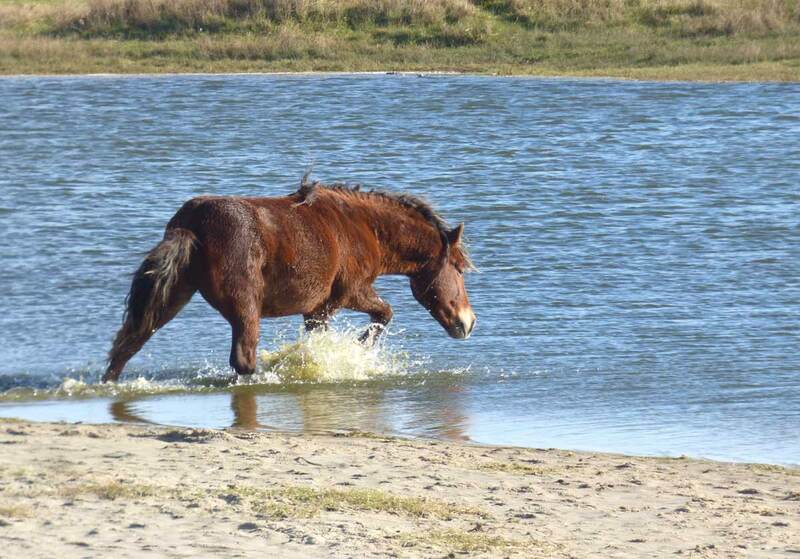 A Sable Island stallion pawing in the edge of Mummichog Pond, a large freshwater pond near West Light. The same stallion galloping around the pond area. There is usually a lot of social activity where groups of horses gather to drink at the freshwater ponds and waterholes. 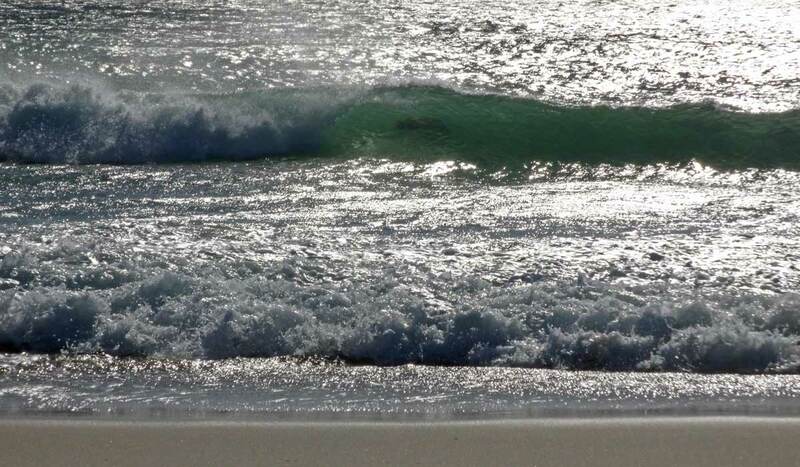 Along the north beach, a solitary seal glides in the green water of a cresting wave. 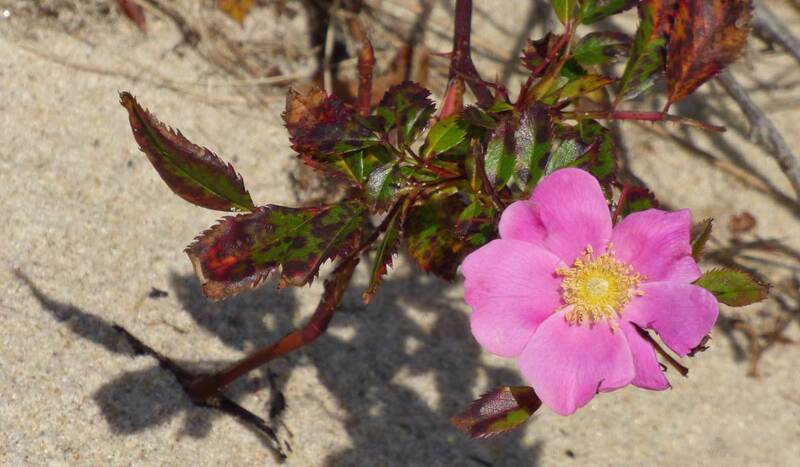 A late-in-the-season bloom of wild rose, an abundant plant on Sable Island. Weather summary for this date: no rain; sunshine hours 8.0; temperature maximum 11.5°C and minimum 7.2°C; with a peak wind of 26 knots southeasterly (SE 130°). 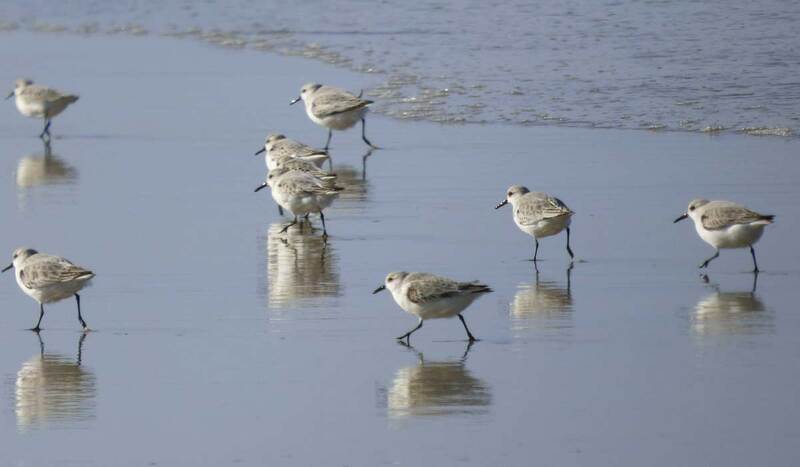 Four Sanderlings fly along the surf. 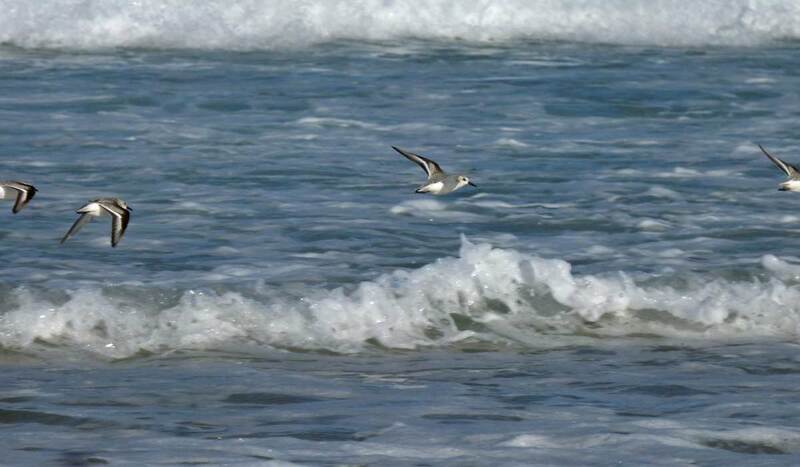 Sanderlings on the beach, feeding and running back and forth with the swash of the waves along the north beach. 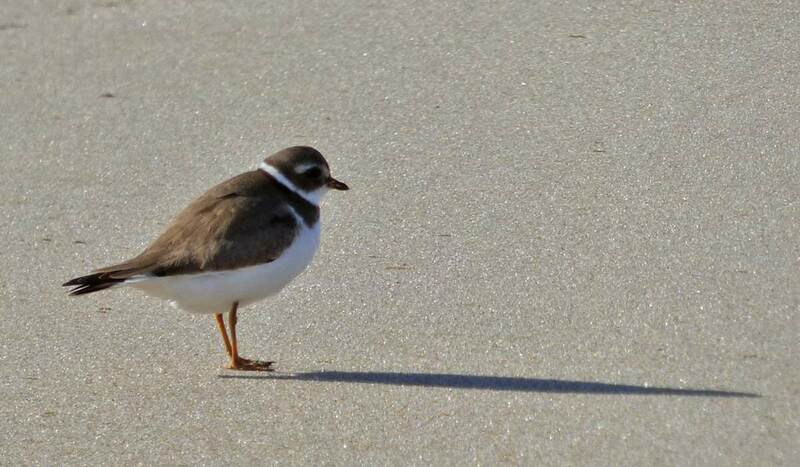 A Semipalmated Plover standing on the wet sand near the edge of the water. 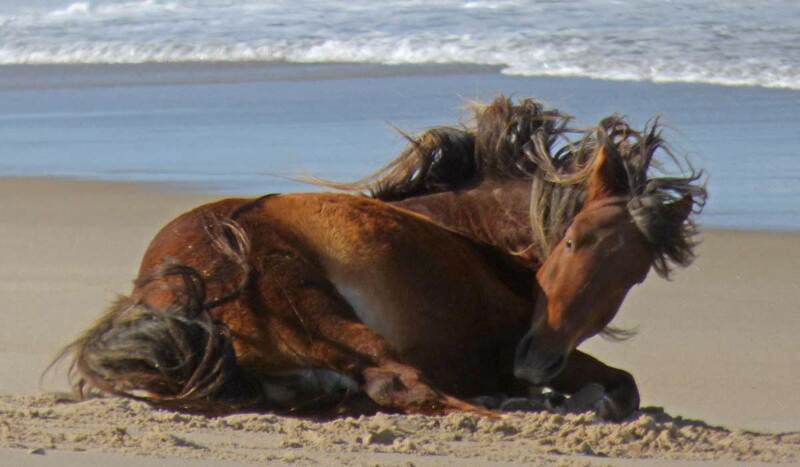 A Sable Island horse rolling on the wet sand of the north beach. Weather summary for this date: no rain; sunshine hours 6.4; temperature maximum 16.3°C and minimum 11.5°C; with a peak wind of 28 knots southeasterly (SE 130°). 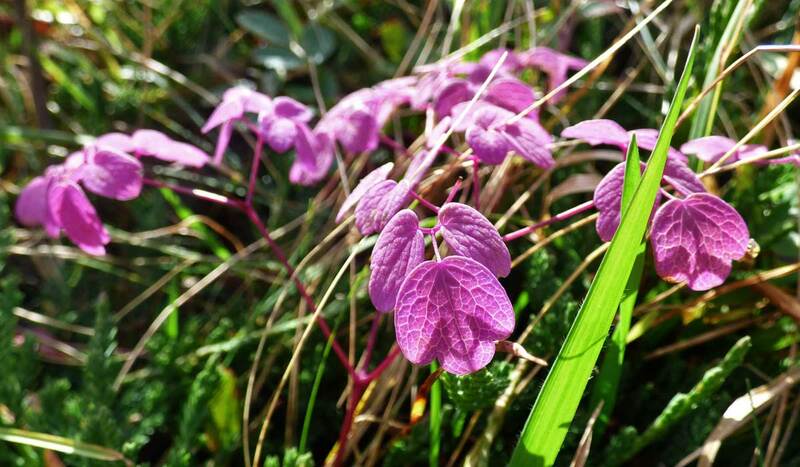 A few stems of Meadowrue, late in the season, with pinkish-purple foliage. Weather summary for this date: no rain; sunshine hours 3.8; temperature maximum 11.3°C and minimum 3.1°C; with a peak wind of 31 knots northeasterly (NNE 030°). 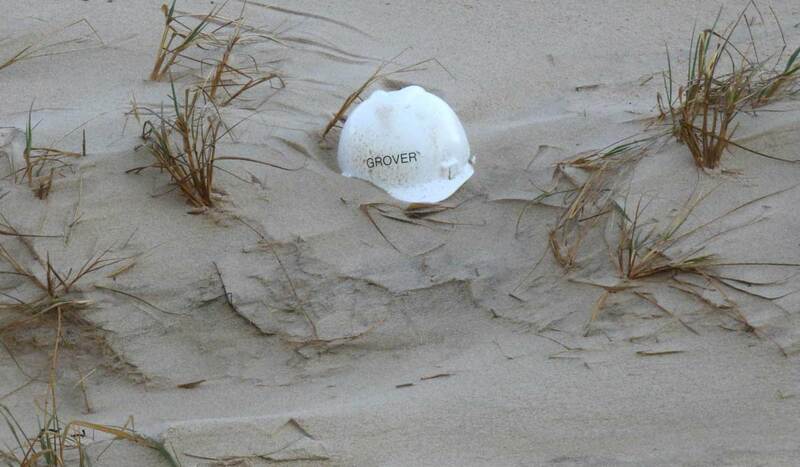 Hard hats occasionally wash ashore on the island. Weather summary for this date: a trace of rain; sunshine hours 1.9; temperature maximum 5.4°C and minimum 2.9°C; with a peak wind of 31 knots westerly (W 280°). 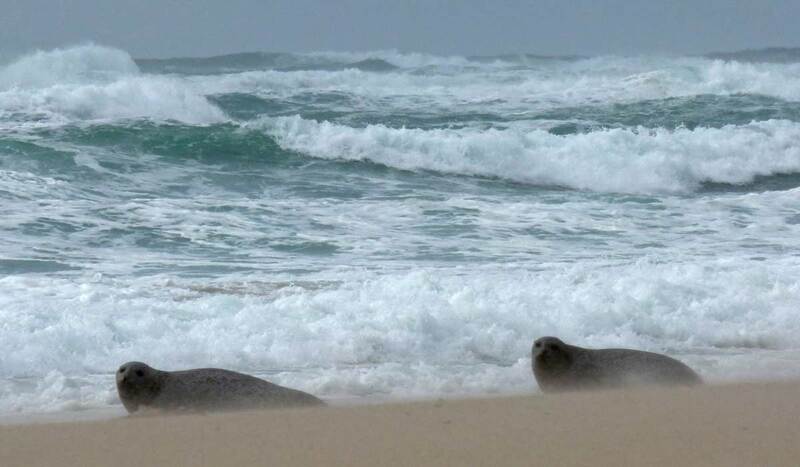 A windy day, and two Harbour Seals are at the edge, between the big surf and blowing sand on the beach. 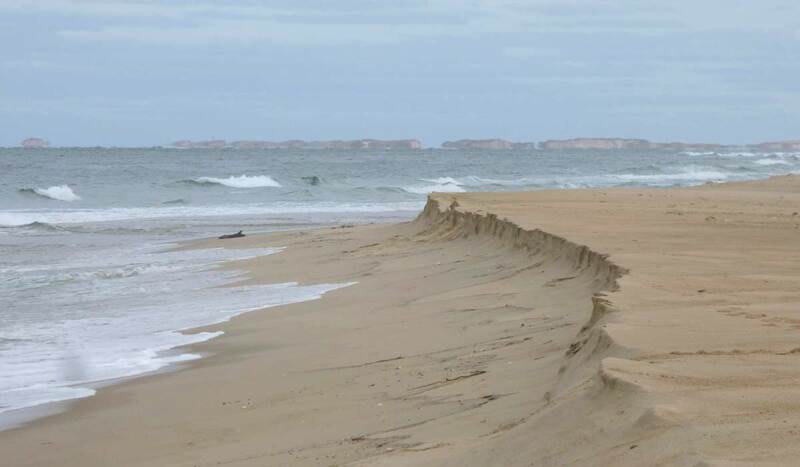 A Sanderling foraging in the swash zone, with two Harbour Seals, on the south beach, west of the station. 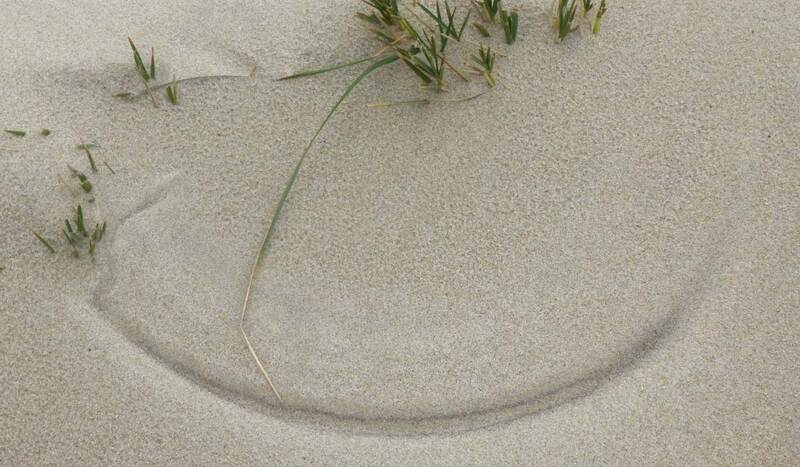 A smile in the sand, sketched by a leaf of beach grass blowing back-and-forth in the wind. Weather summary for this date: no rain; sunshine hours 5.6; temperature maximum 7.7°C and minimum 0.4°C; with a peak wind of 13 knots northwesterly (NW 320°). 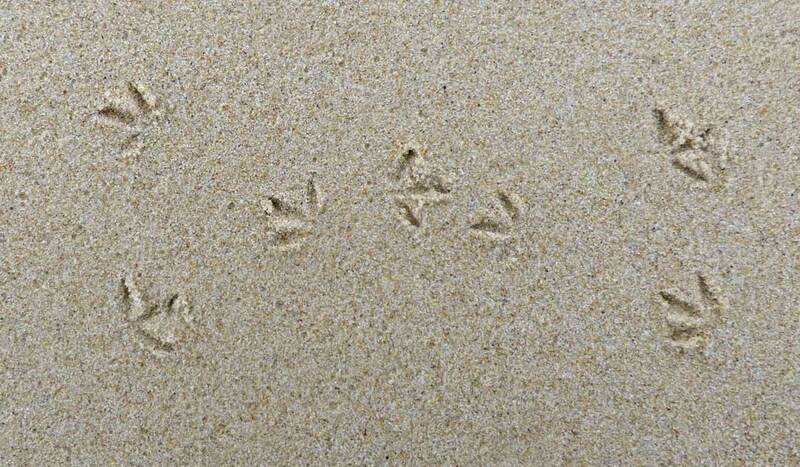 Bird tracks on the north beach. 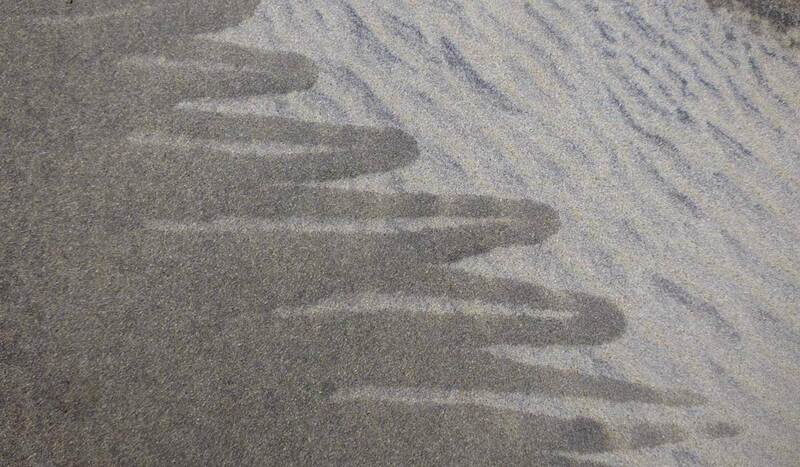 A pattern of heavy mineral sands on the south beach, made by wind and water. The north beach, looking eastward. 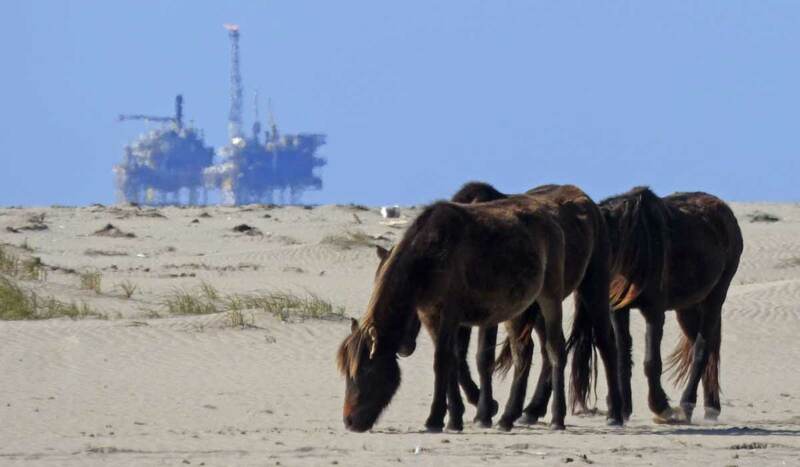 A band of horses eating fragments of Sandwort washed ashore on the north beach, west of the station. Leftover beached Sandwort, after horses have been snacking. 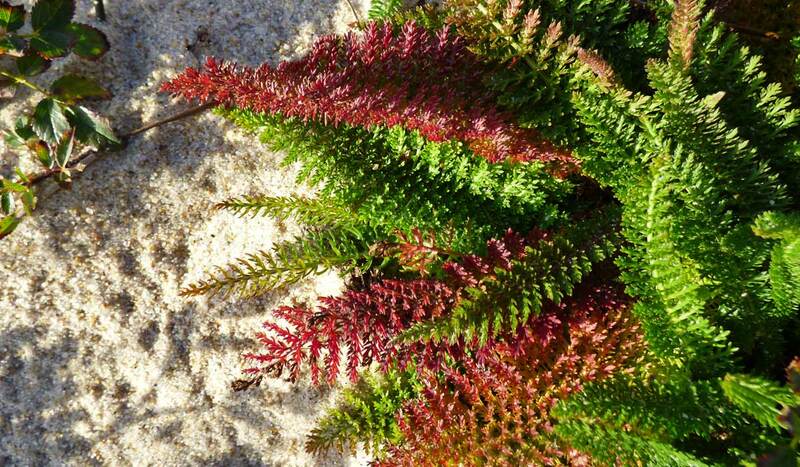 Close-up of the salted Sandwort beach snack—a year-round favourite. 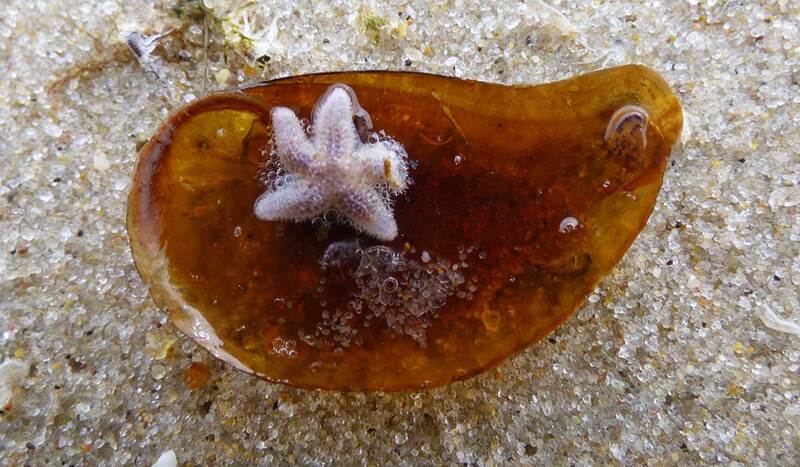 Tiny starfishes are still washing ashore, this one on a small raft made of a moon snail operculum. Weather summary for this date: 0.2 mm of rain; sunshine hours 4.7; temperature maximum 10.9°C and minimum 3.9°C; with a peak wind of 25 knots southeasterly (SE 130°). 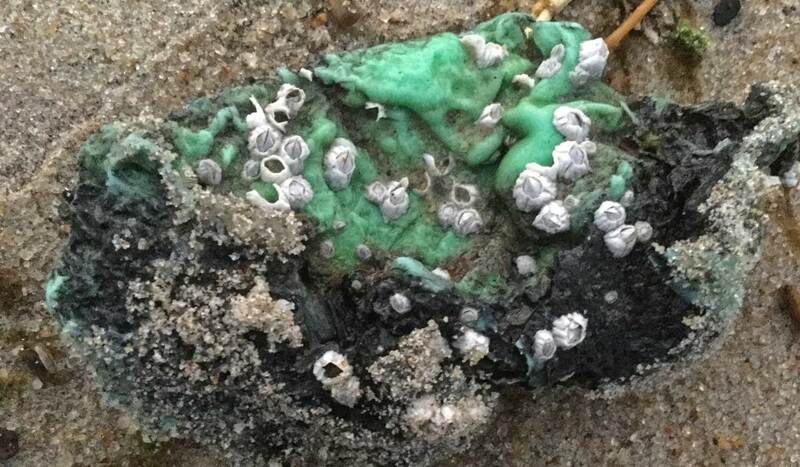 Acorn barnacles on a lump of half-burned plastic garbage—marine debris washed ashore on Sable Island. Weather summary for this date: 13.0 mm of rain; sunshine hours 4.9; temperature maximum 12.4°C and minimum 5.9°C; with a peak wind of 39 knots southwesterly (WSW 240°). 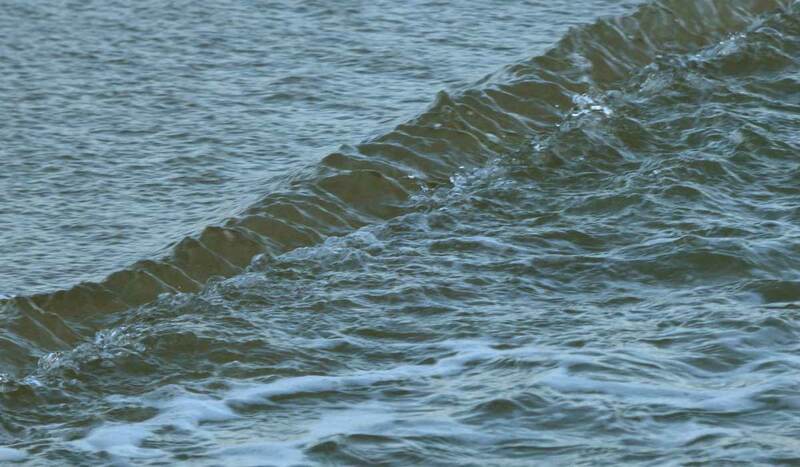 An unusual ripple pattern where flows of beach overwash waters collide. 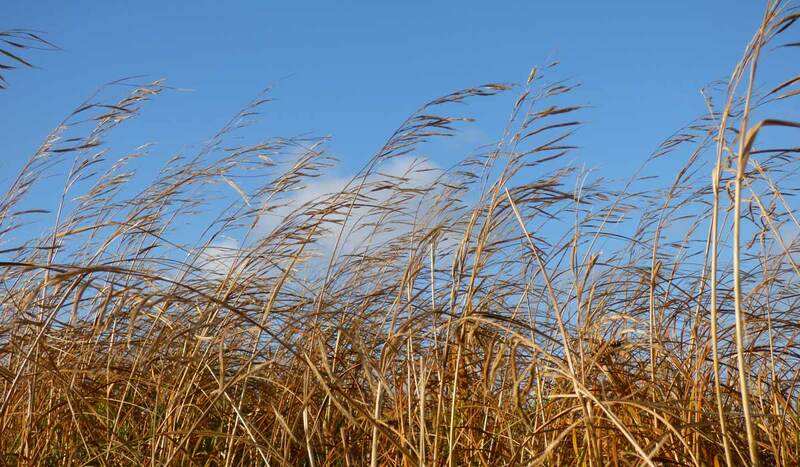 Some fall colours on Sable Island—a stand of cord-grass. 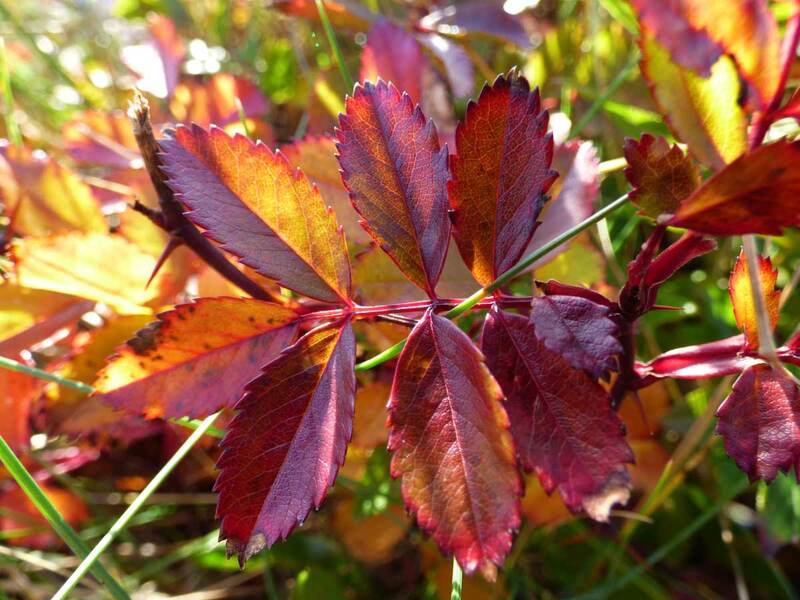 Autumn colours of Wild Rose foliage. 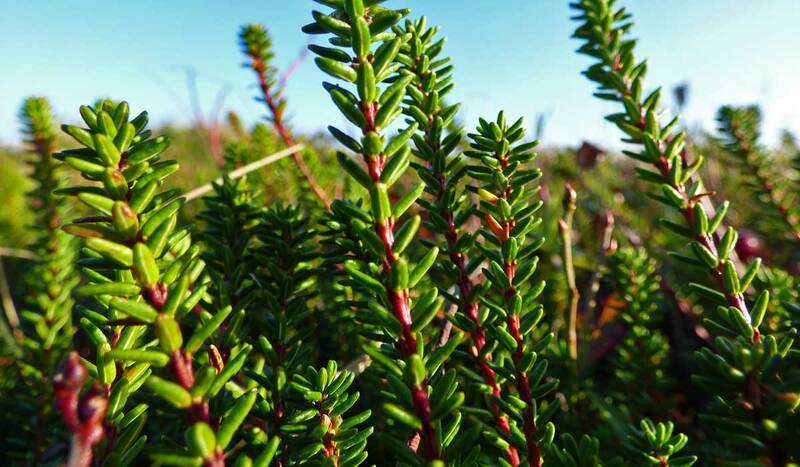 Stems and leaves of Black Crowberry. A ripe cranberry, surrounded by the plant’s rusty-red foliage; and a cluster of rose hips. Weather summary for this date: 1.4 mm of rain; sunshine hours 0.0; temperature maximum 13.9°C and minimum 6.1°C; with a peak wind of 31 knots southwesterly (SW 230°), with thunder storm activity recorded. 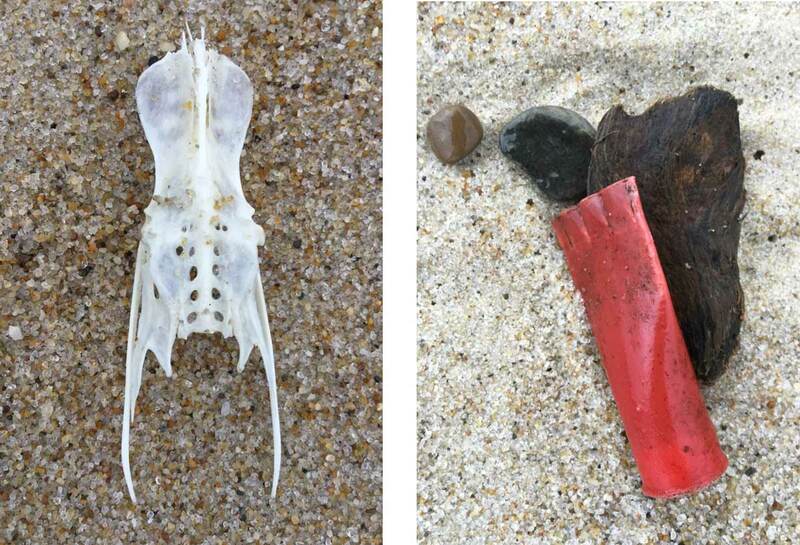 Beached materials—a bird bone (synsacrum), and a couple of small stones, a piece of waterlogged wood and a plastic shotgun shell casing. 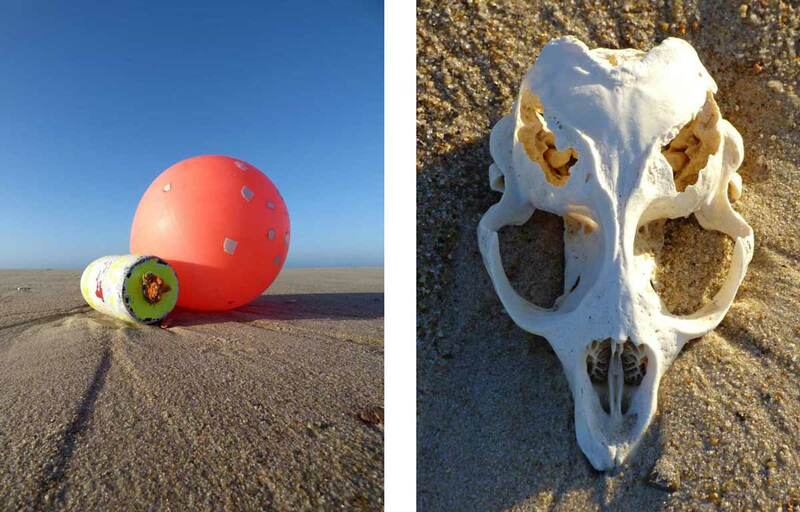 These casings are very common amongst the plastic litter pollution washing ashore on Sable Island. Weather summary for this date: 0.2 mm of rain; sunshine hours 6.5; temperature maximum 12.2°C and minimum 7.8°C; with a peak wind of 25 knots southeasterly (ESE 110°). 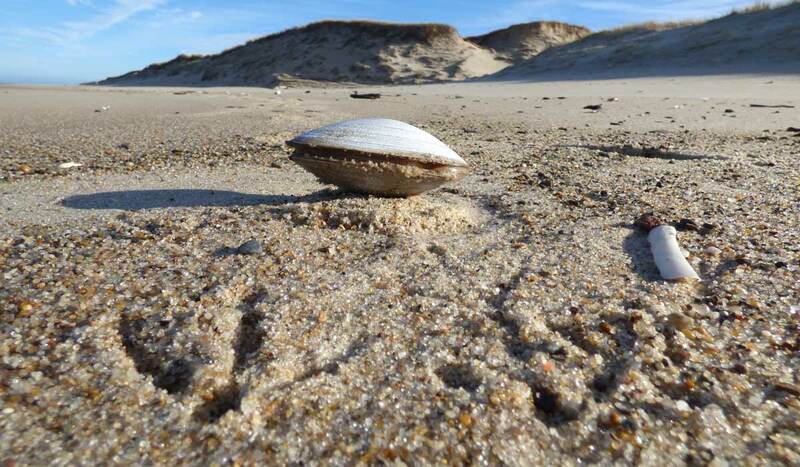 A surf clam washed ashore. 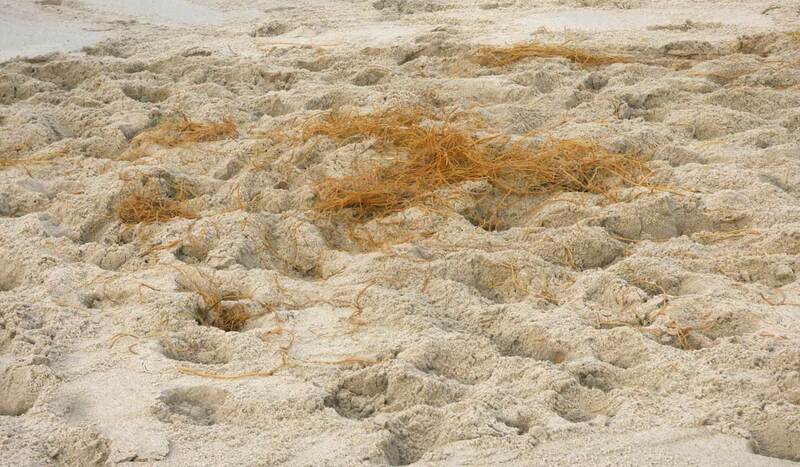 In the foreground are the footprints of a gull that had been trying to pry open the shell and eat the clam. 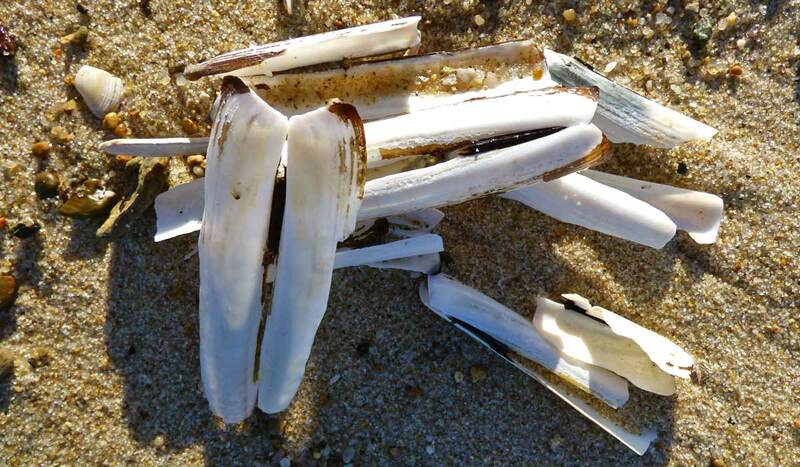 Shells of razor clams (also called jackknife clams). 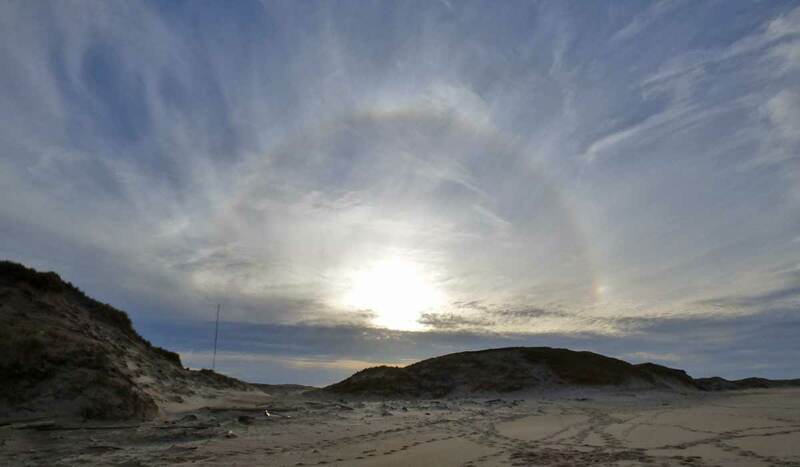 Looking towards the southwest from the north beach (4:10 pm local time, 19:10 GMT), a sun halo–an optical phenomena produced by sunlight interacting with ice crystals suspended in the atmosphere. Weather summary for this date: 3.6 mm of rain and snow combined; sunshine hours 1.6; temperature maximum 2.4°C and minimum -0.9°C; with a peak wind of 30 knots northwesterly (NNW 330°). 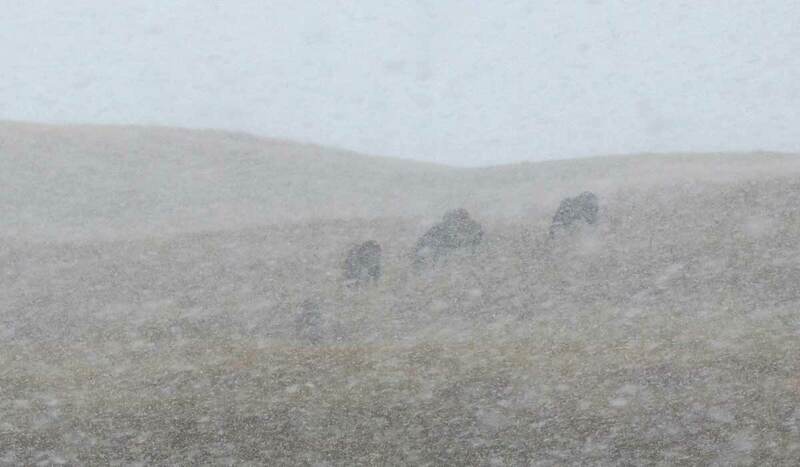 Horses almost hidden by the snow. Weather summary for this date: 1.0 mm of rain; sunshine hours 3.8; temperature maximum 11.1°C and minimum 2.3°C; with a peak wind of 31 knots northwesterly (NNW 330°). 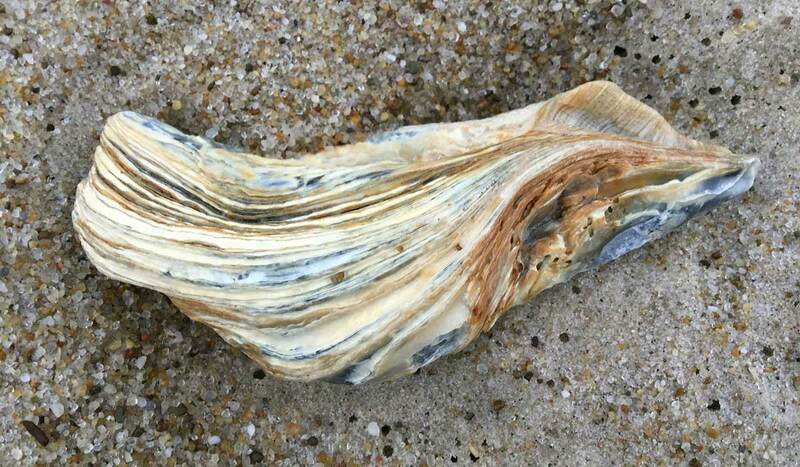 A fragment of an oyster shell. 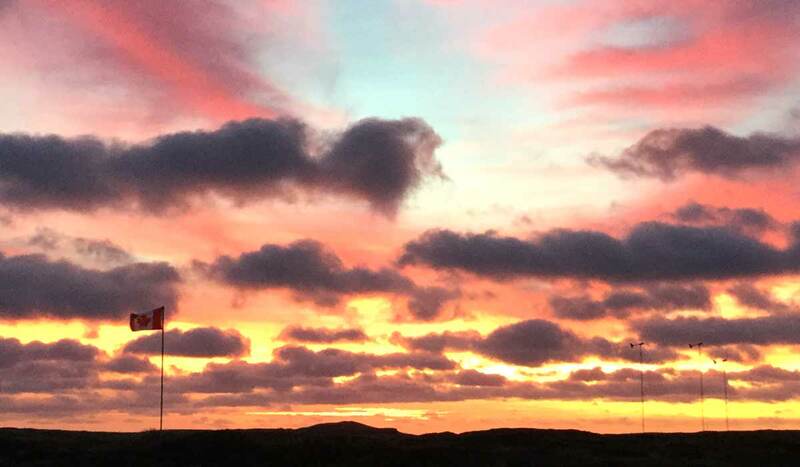 Sunrise (6:55 am, 9:55 GMT) with low lines of stratocumulus clouds, a view from the MSC office. Weather summary for this date: 2.4 mm of rain; sunshine hours 1.7; temperature maximum 5.9°C and minimum -2.8°C; with a peak wind of 34 knots northwesterly (NNW 340°). 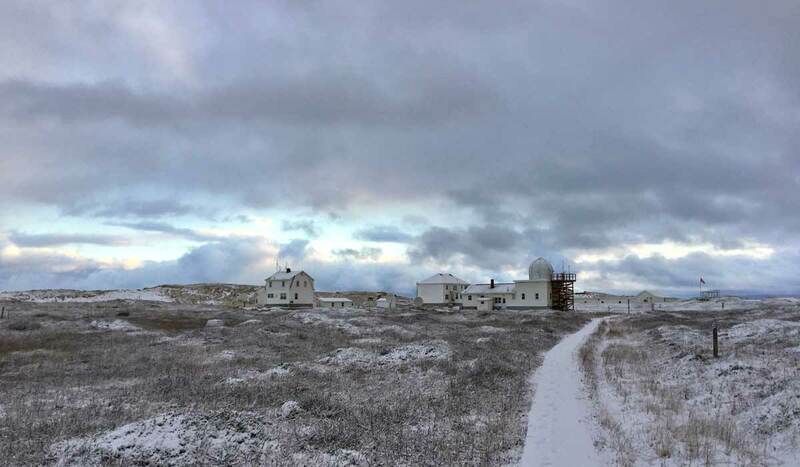 The Sable Island Station in snow remaining from the snowfall on the 28th. The building with the dome is the operations office for the Meteorological Service of Canada. Weather summary for this date: 0.6 mm of rain; sunshine hours 0.9; temperature maximum 7.8°C and minimum 5.1°C; with a peak wind of 18 knots westerly (W 260°). 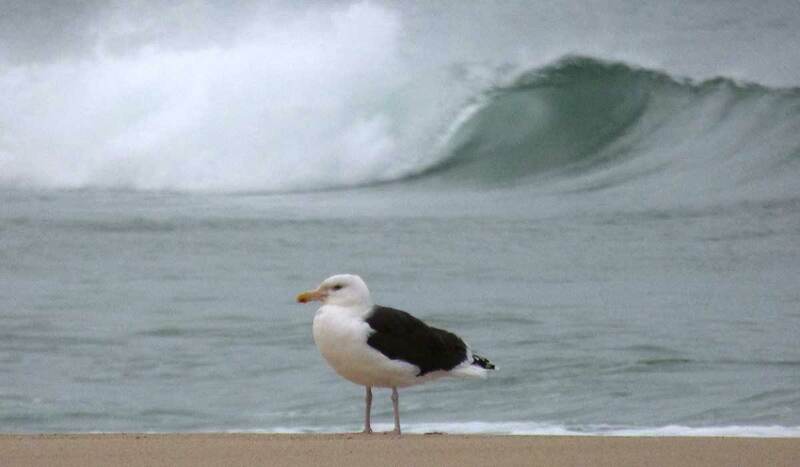 An adult Great Black-backed Gull standing on the north beach. This is one of the two gull species which regularly nest on Sable Island. Weather summary for this date: 14 mm of rain; sunshine hours 1.2; temperature maximum 11.4°C and minimum 2.0°C; with a peak wind of 36 knots southerly (S 190°). 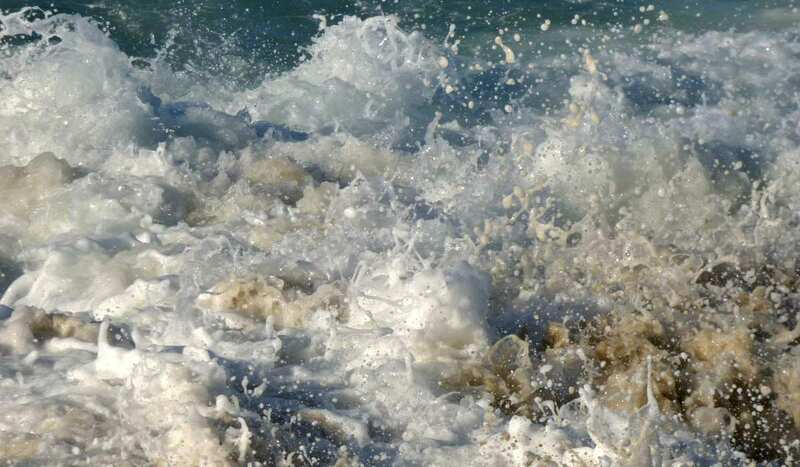 The ocean swashes across a wide, flat area of the south beach. 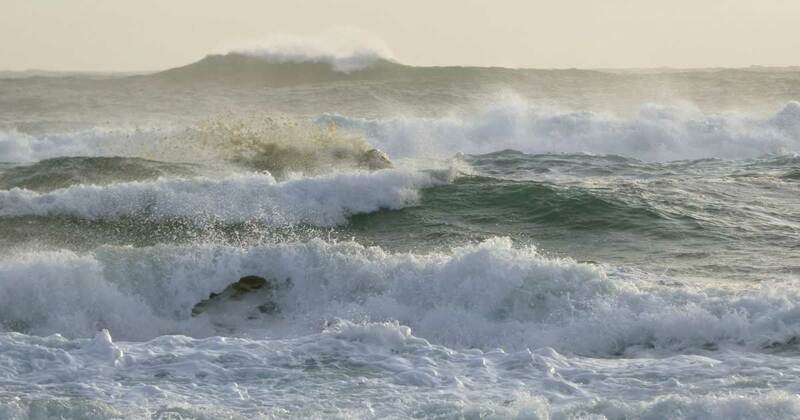 Beyond the relatively calm water’s edge, the surf is leaping and roaring. 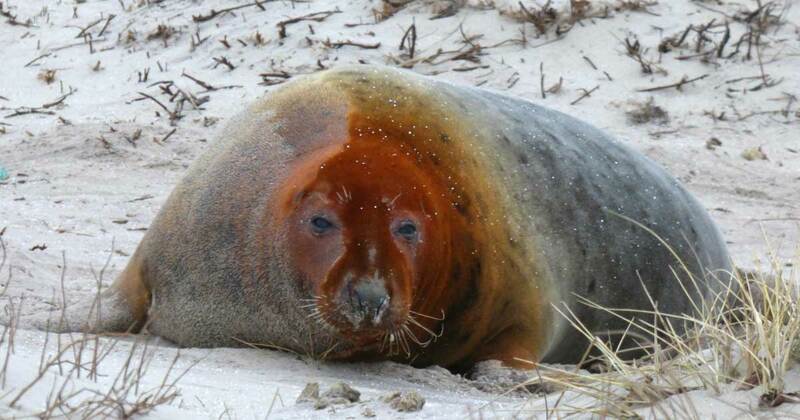 Grey Seals gathering on the beach and dunes for their December-January breeding season. Weather summary for this date: 0.4 cm of snow; sunshine hours 0.3; temperature maximum -0.9°C and minimum -4.7°C; with a peak wind of 43 knots westerly (W 270°). 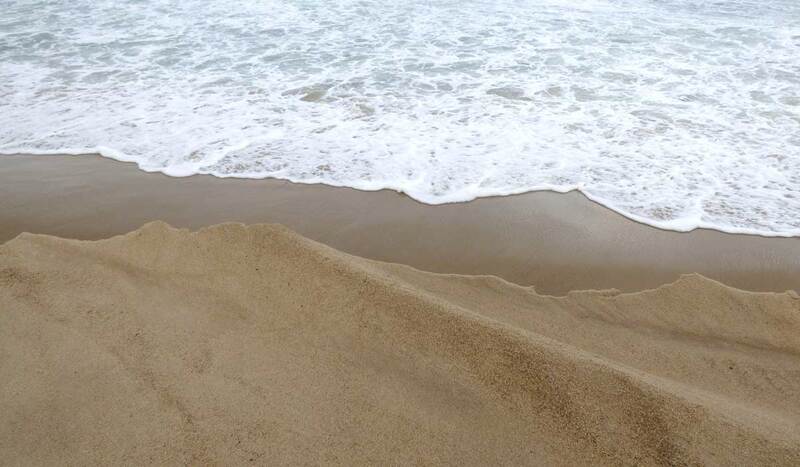 In the strong winds, a lot of sand is blowing about. 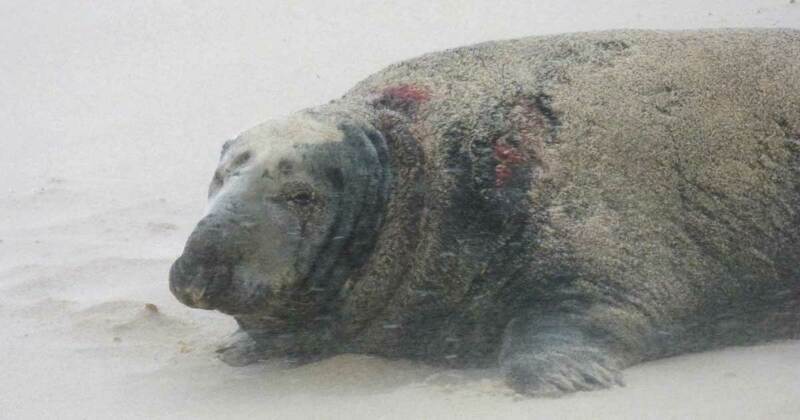 An adult male Grey Seal shows some patches of blood, signs of fighting with other males in the colony. 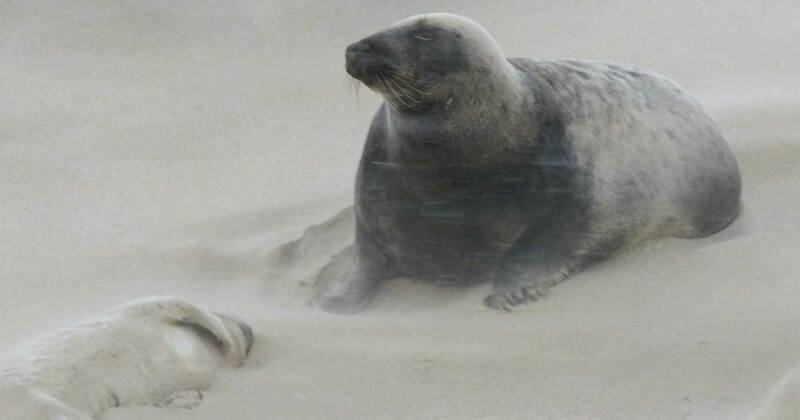 An adult female Grey Seal and her pup, on the beach—in the wind-blown sand. 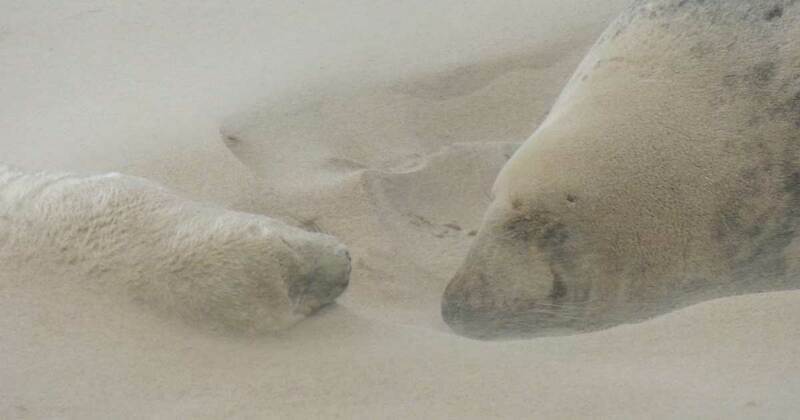 Another Grey Seal mother and pup pair, with eyes closed as the blowing sand accumulates around them. Weather summary for this date: 0.2 cm of snow; sunshine hours 0.0; temperature maximum 0.7°C and minimum -3.2°C; with a peak wind of 32 knots northwesterly (NW 320°). 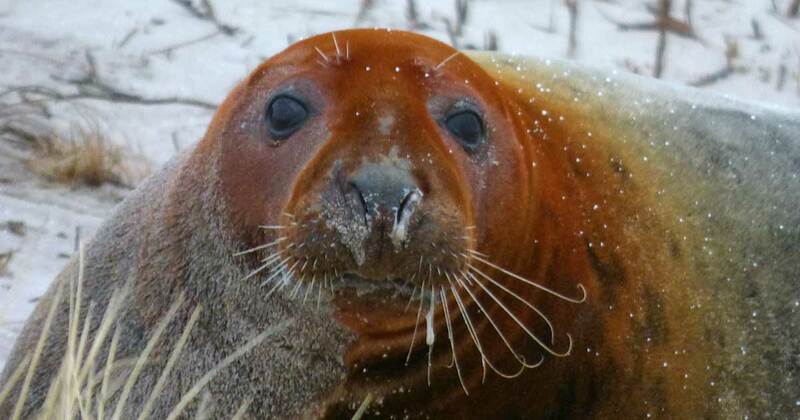 An adult female Grey Seal in the breeding colony. Some of the adults have a rusty-red stain on their heads. 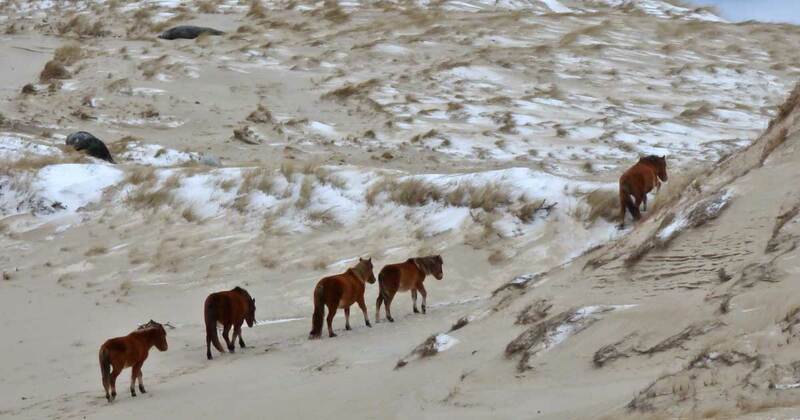 A family band of Sable Island horses walk through a wind-swept valley in the dunes, with two Grey Seals resting on the slope nearby. 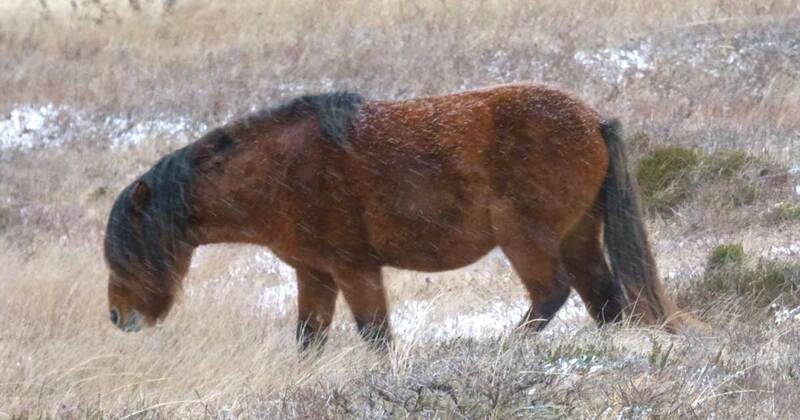 A Sable Island horse, head down, walks into the wind and blowing snow. An Ipswich Sparrow. 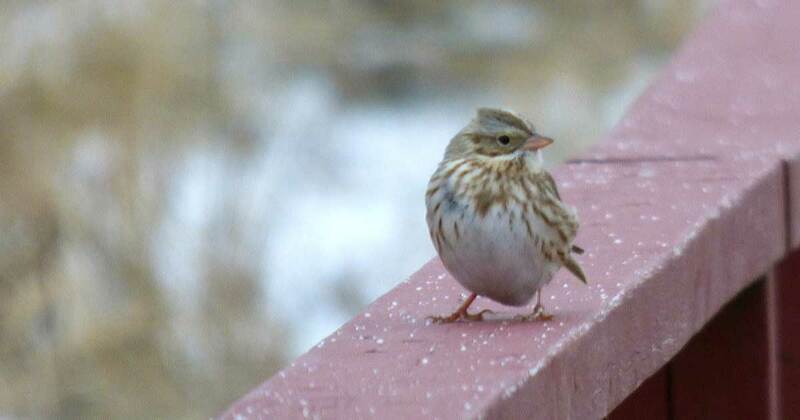 Although most of these birds migrate to their wintering area along the east coast, a few hundred individuals usually stay to spend the winter on Sable Island. 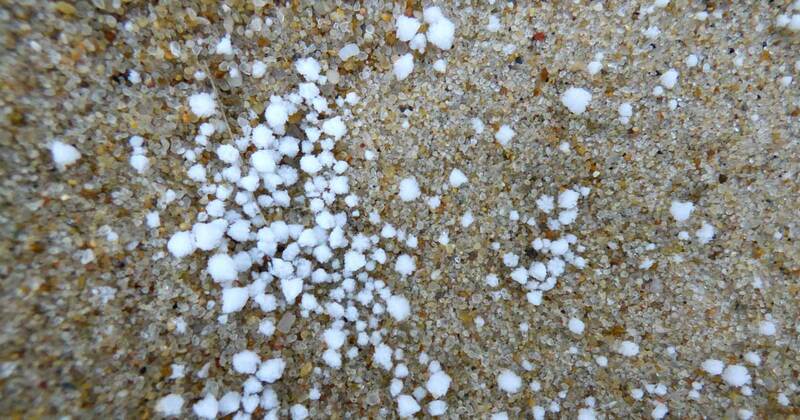 Snow pellets—brittle and easily crushed, they don’t last long. Snow pellets normally occur when temperatures near the surface are close to 0 °C. 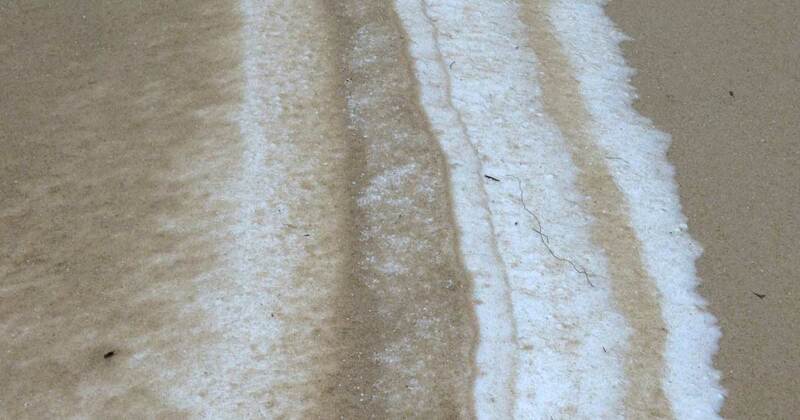 Pattern of snow and sand on the beach. Three horses grazing on the top of a dune ridge, and a Grey Seal in the small valley below. Weather summary for this date: 5.2 cm of snow; sunshine hours 2.1; temperature maximum 0.1°C and minimum -2.8°C; with a peak wind of 28 knots northwesterly (NW 310°). 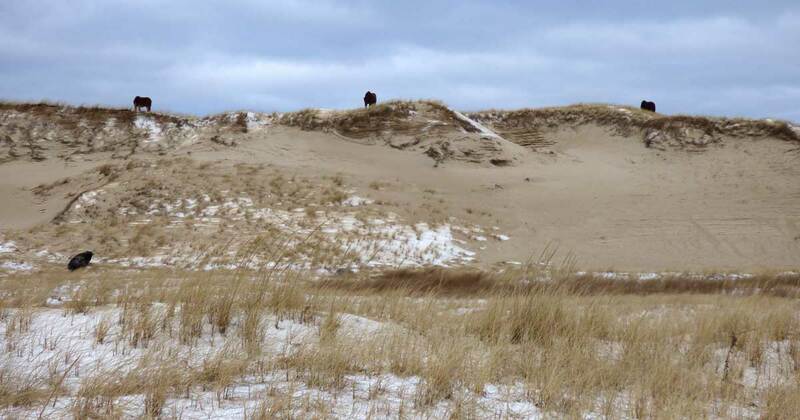 The two photos above show the same view, looking towards the north beach, just east of the Sable Island Station—the first shows sand and beach grass on December 27th, and in the next view, 0n December 30th, the same area is covered by snow. 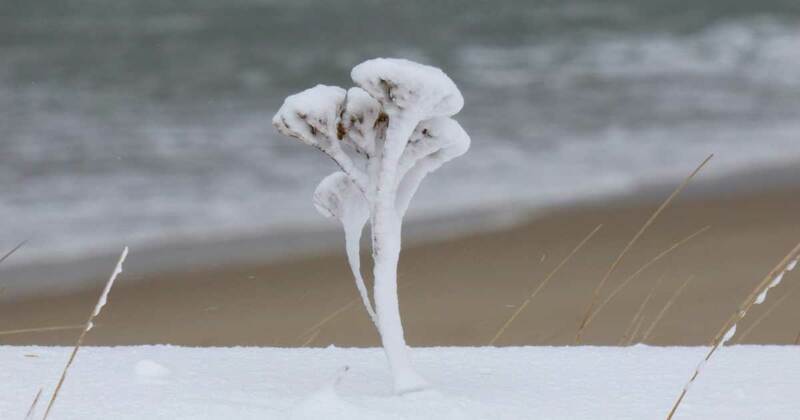 The dry stem and flowers of a Yarrow plant covered by snow. 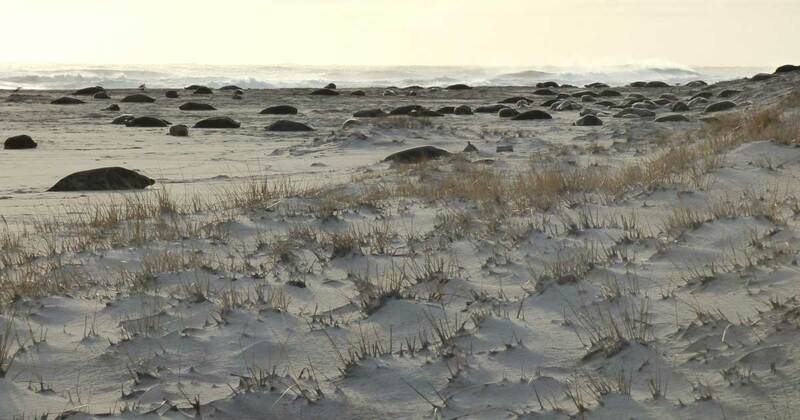 Grey Seal breeding colony on the north beach, looking towards the east. 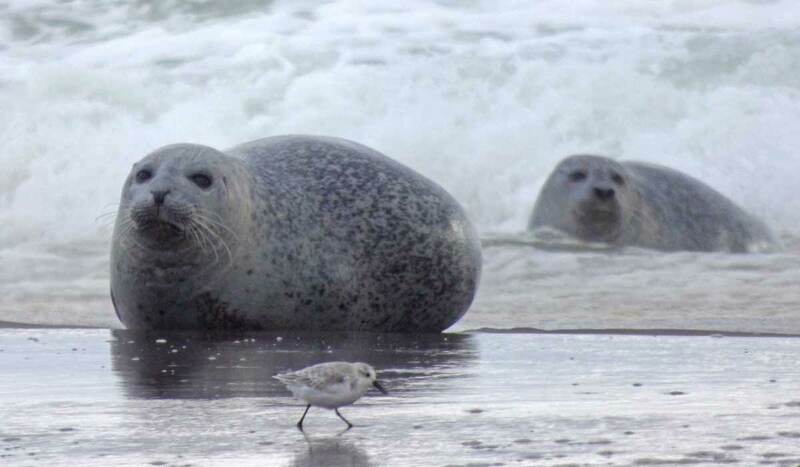 In the distance, three researchers studying the seals travel along the edge of the colony. 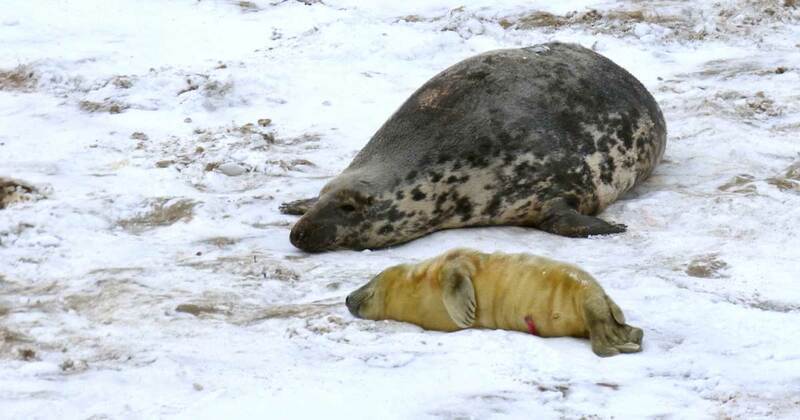 A Grey Seal mother and her young pup, the fresh stump of the umbilicus is on the pup’s belly. 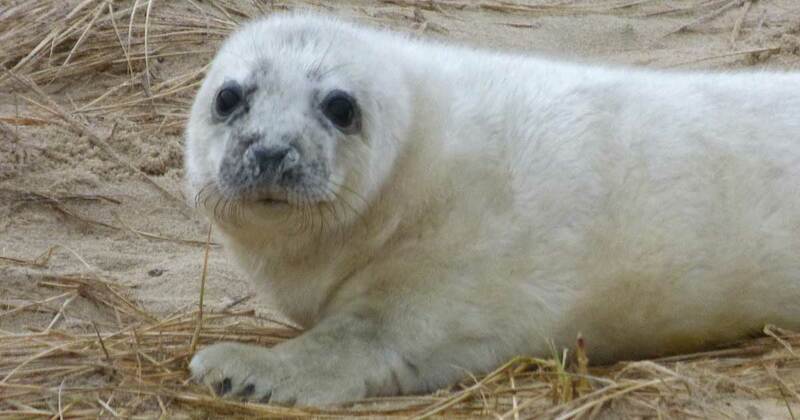 The newborn pup has a darkly yellow coat, but it will begin to turn white in a few days. 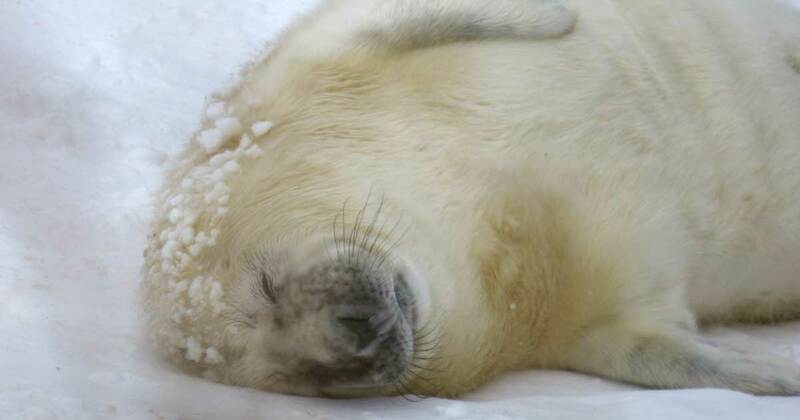 During the few days after birth, the pup’s coat becomes a pale lemony colour, and eventually white. Weather summary for this date: 1.2 mm of rain; sunshine hours 2.7; temperature maximum 9.0°C and minimum 0.4°C; with a peak wind of 50 knots southwesterly (WSW 240°). 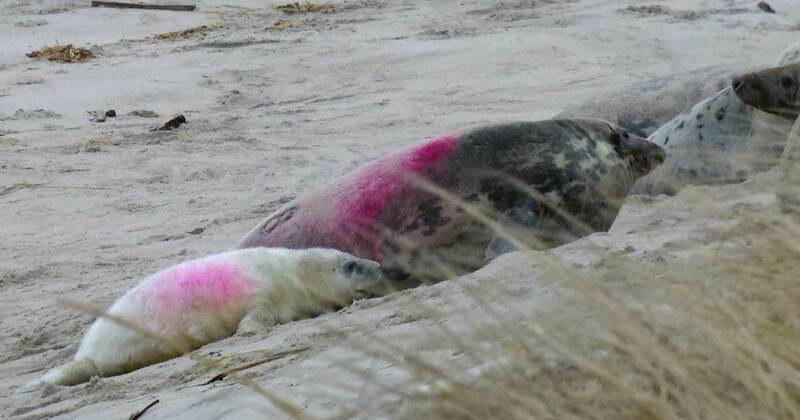 A Grey Seal mother and her pup are marked with a bright pink stain applied by the research team. Weather summary for this date: 5.8 mm of rain; sunshine hours 0.0; temperature maximum 6.5°C and minimum -0.6°C; with a peak wind of 33 knots southerly (SSW 200°). 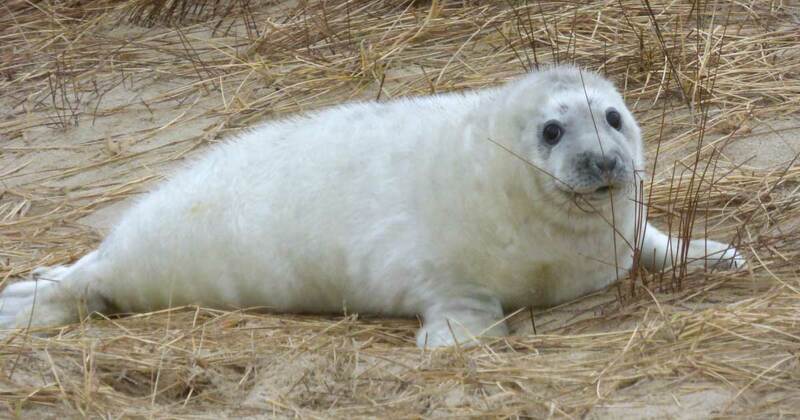 Two whitecoat Grey Seal pups. My tour ended on January 10th, but I was delayed by weather until the 18th. Then I returned to home in Pictou County to prepare for my trip to Mexico, Guatemala and Belize. 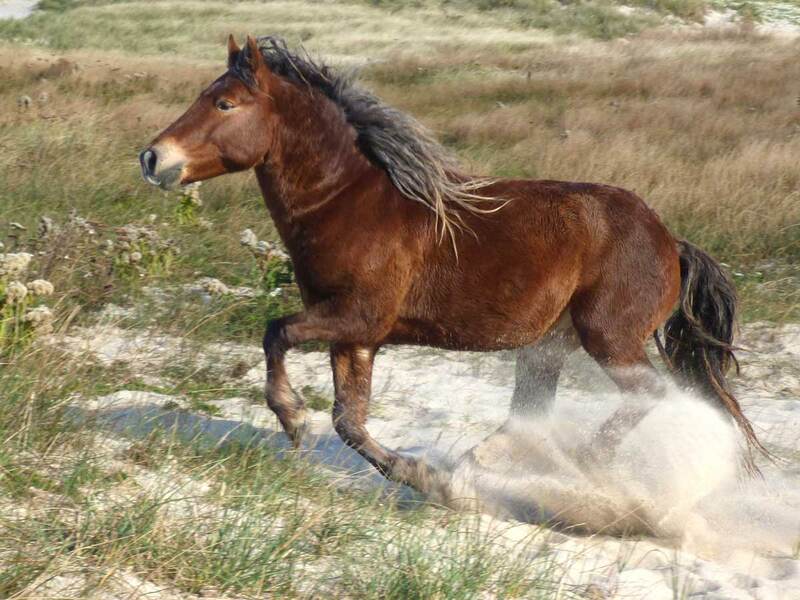 I am scheduled to return to Sable Island on April 4th. Also, see Gina’s PhotoBlogs for April-July, 2017 and April-June, 2018, and her contributor’s profile.